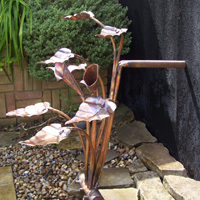 My business is now made up of around 95% bespoke commissions. 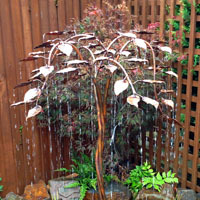 The website offers ideas and a price guide. 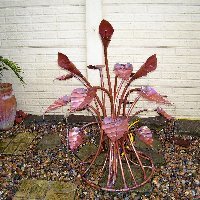 I always try to keep in stock some features in the �0.00 to �50.00 price range so that clients can view them working and it can then help them decide on a possible style. 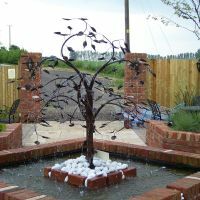 If on the other hand one of these particular features meets their requirements, they can also purchase it there and then. 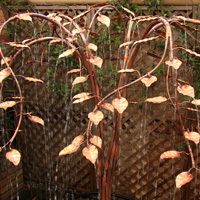 Weeping willow style with beech leaves. 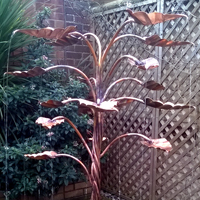 1500mm in height, 1200 mm in width. 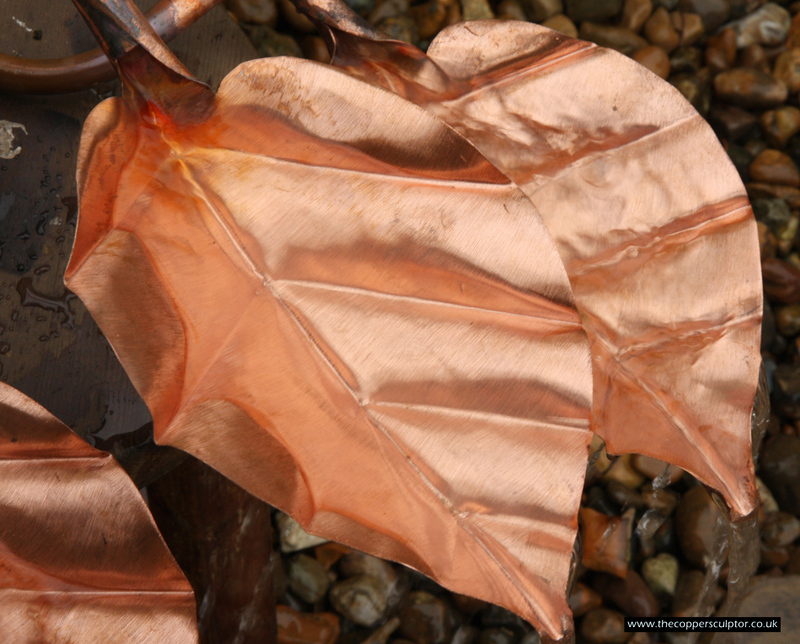 157 water fed leaves. 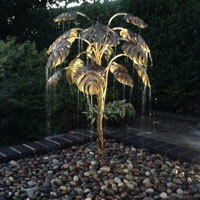 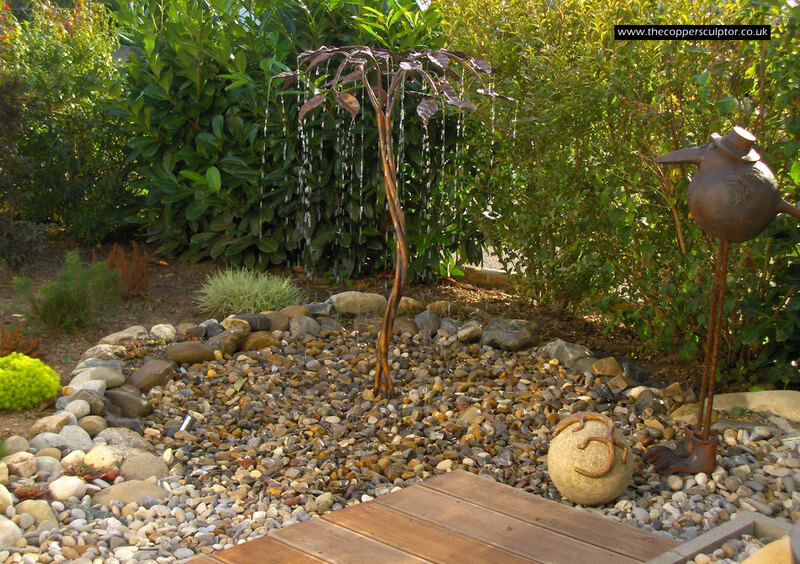 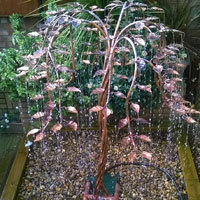 This is a all round water feature that can be made front facing. 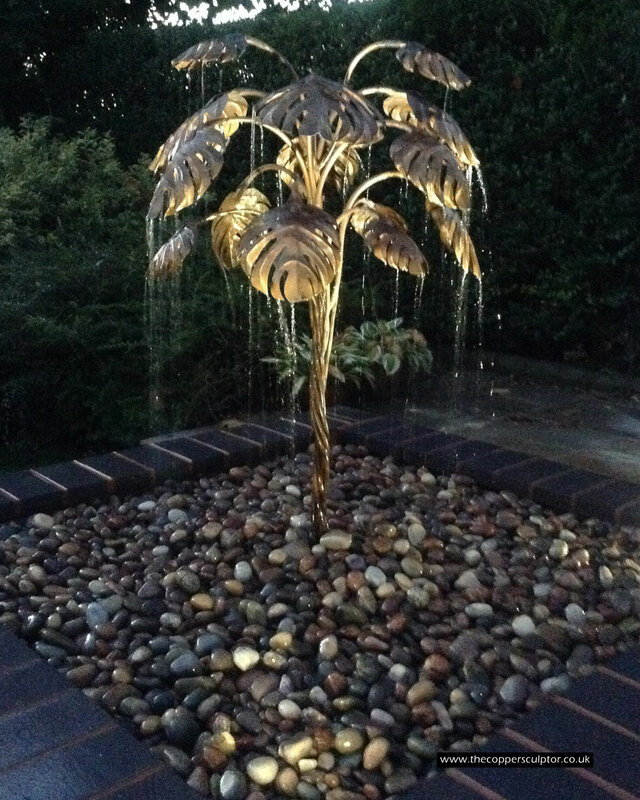 This feature was built to fit perfectly into a crate, it arrived safely in Germany and I personally think it looks stunning in it's new surroundings. 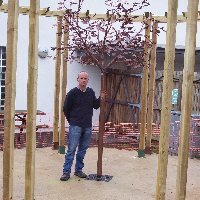 Thanks Thomas for finding the time to pass this photo onto me. 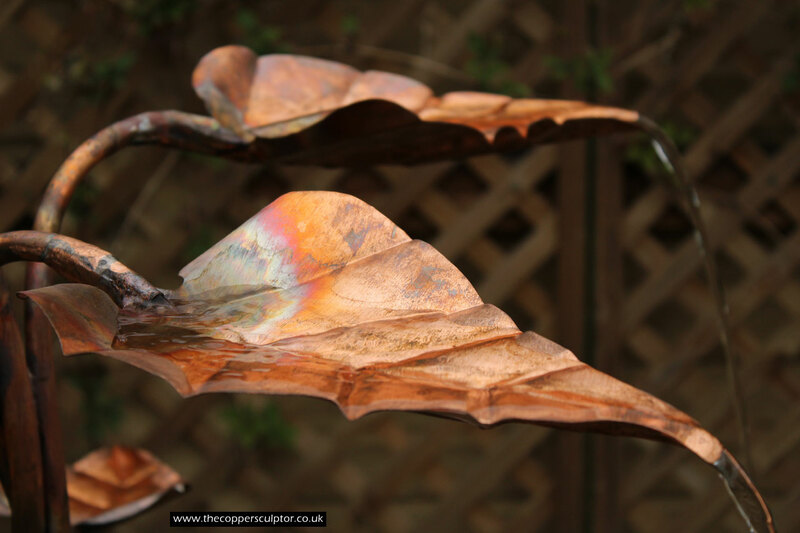 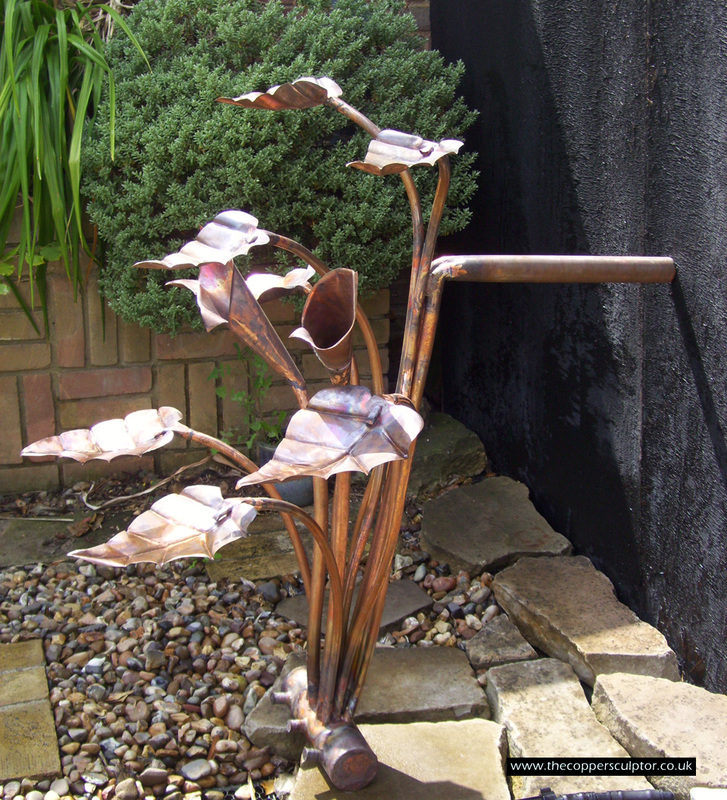 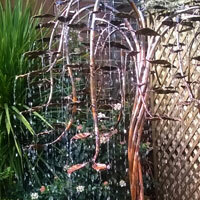 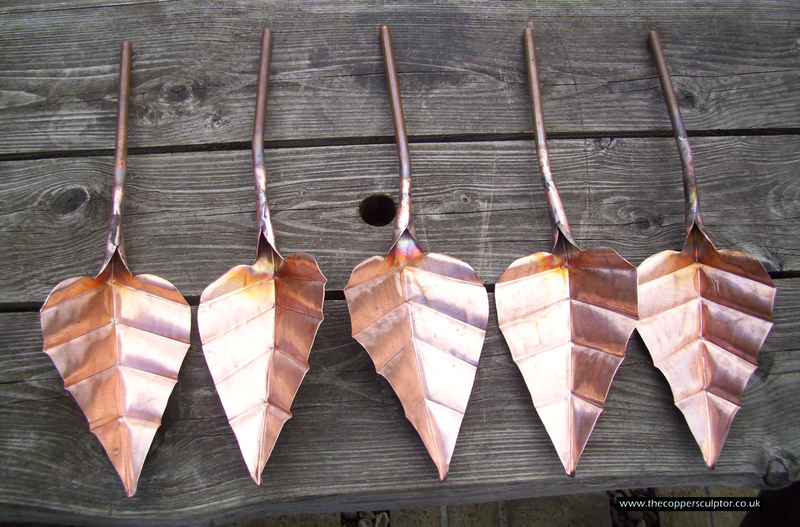 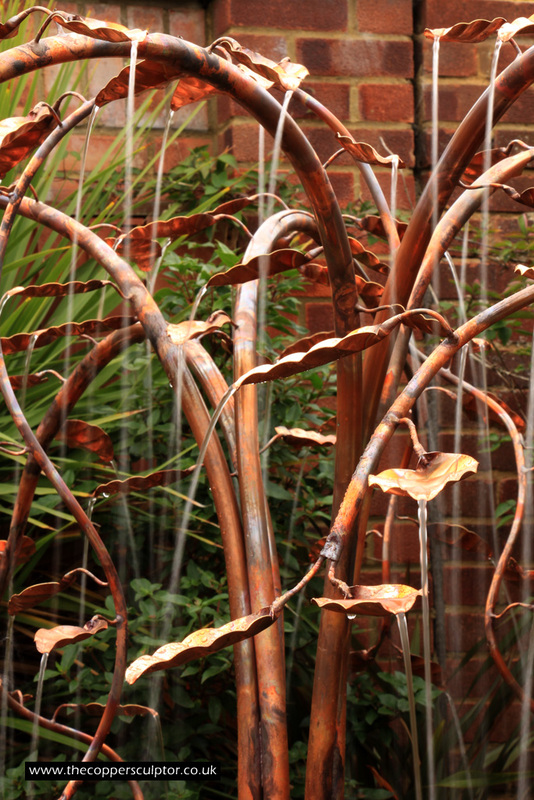 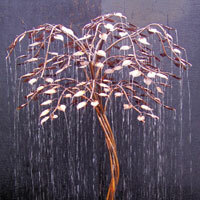 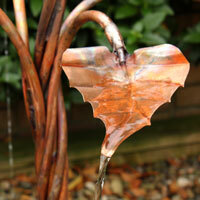 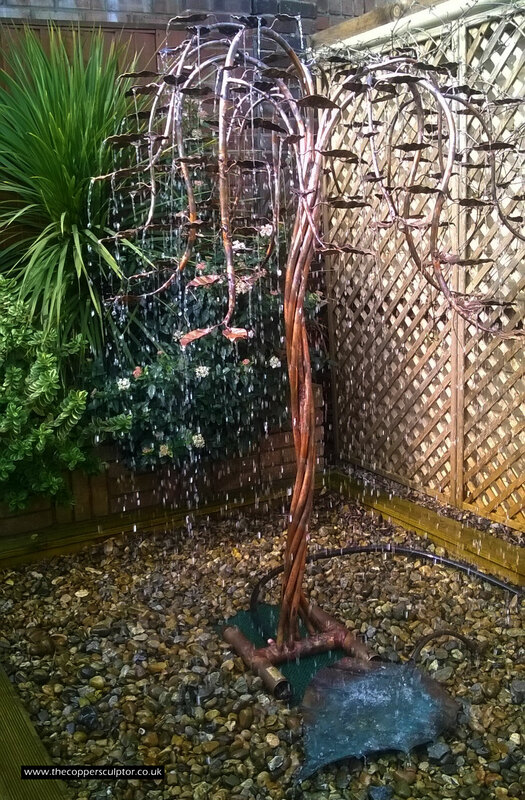 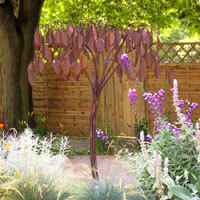 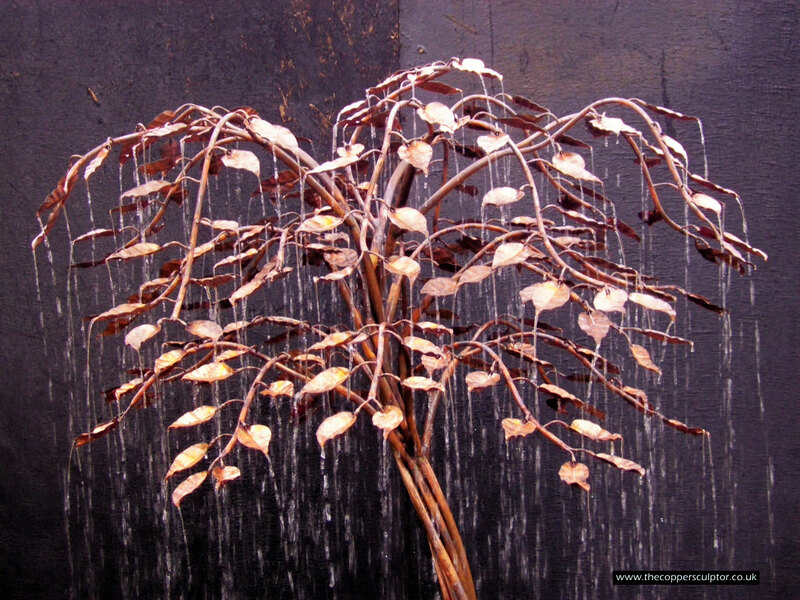 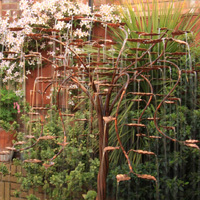 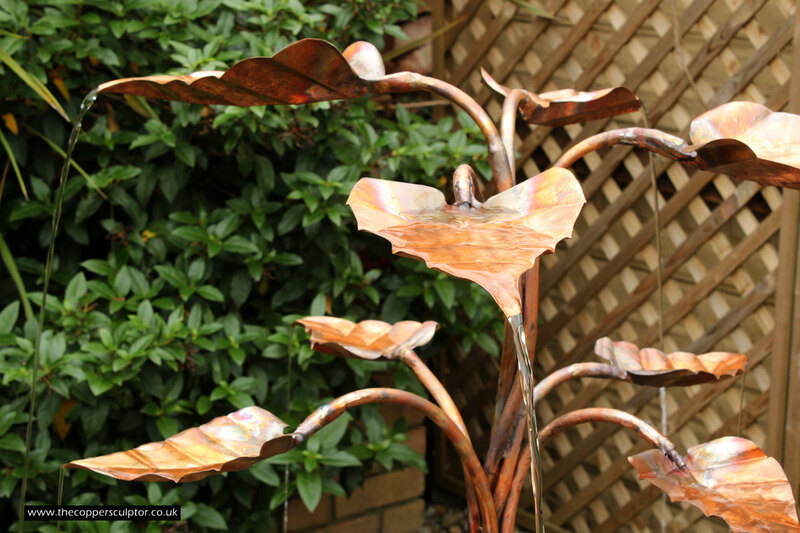 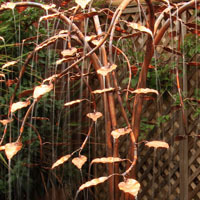 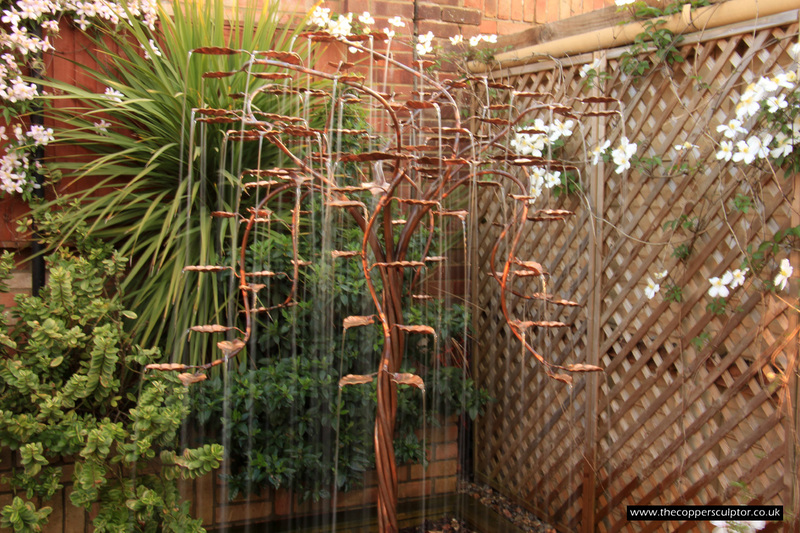 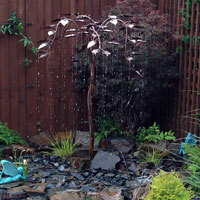 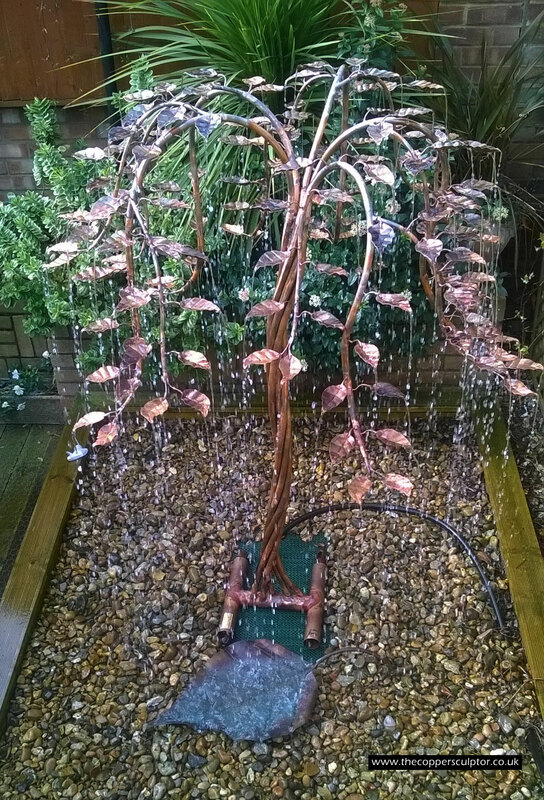 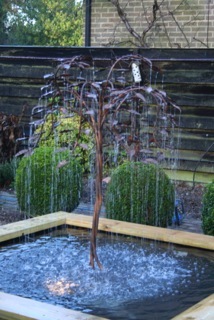 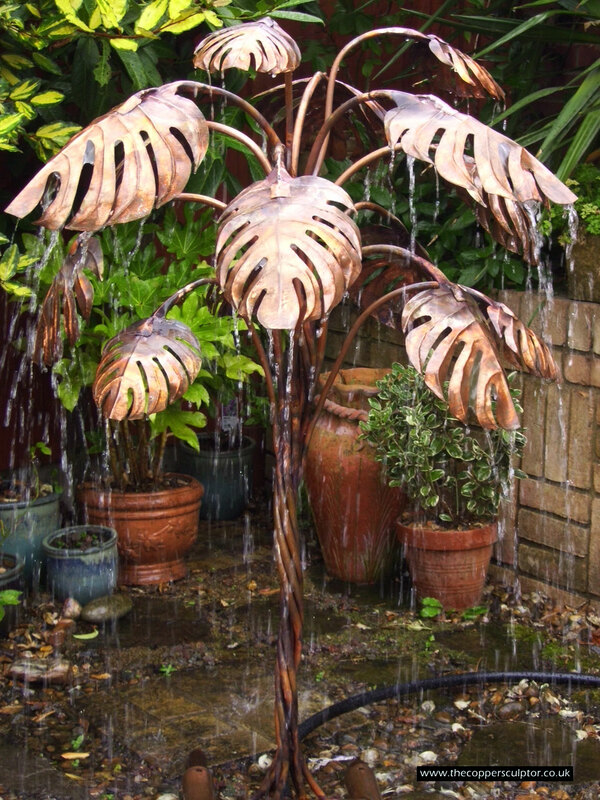 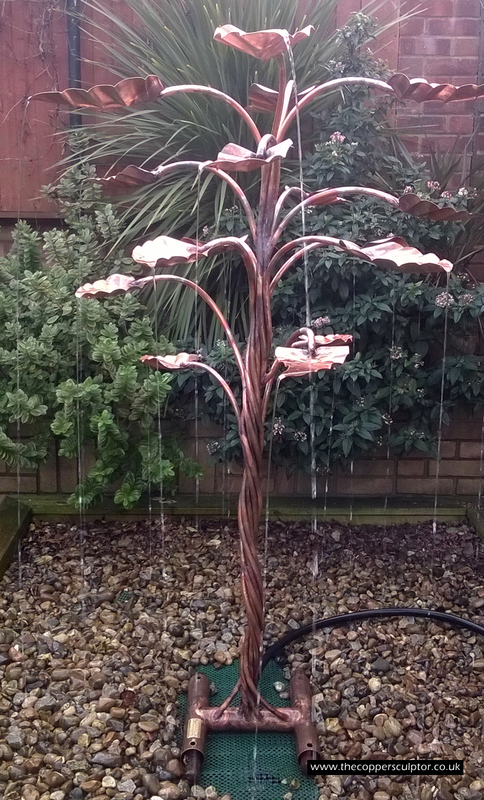 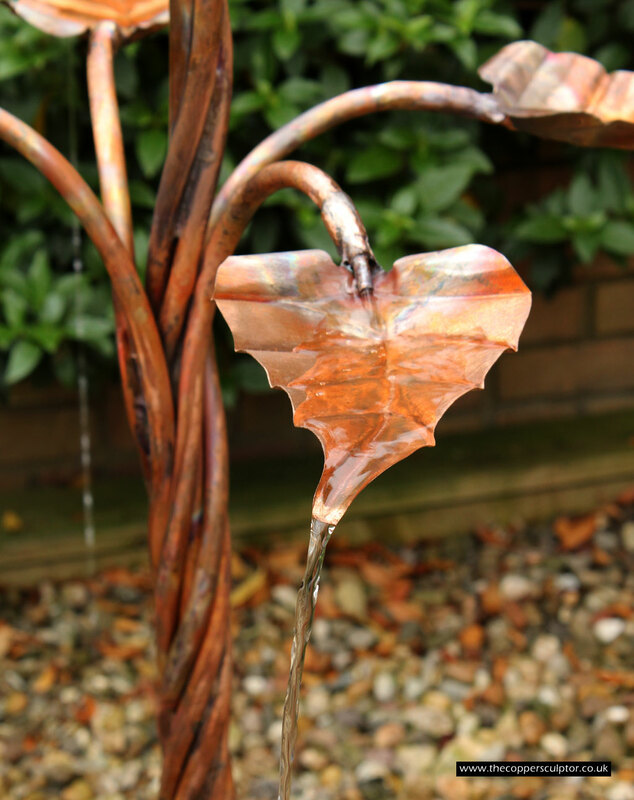 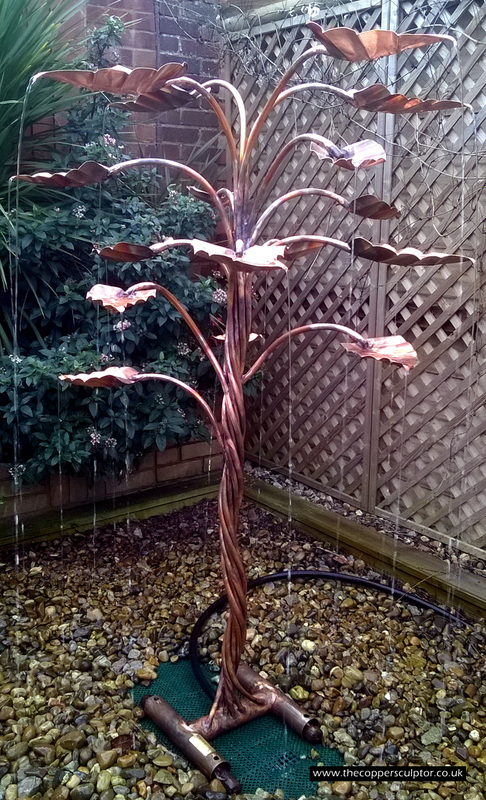 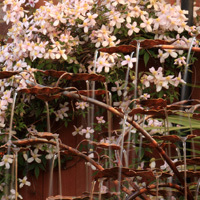 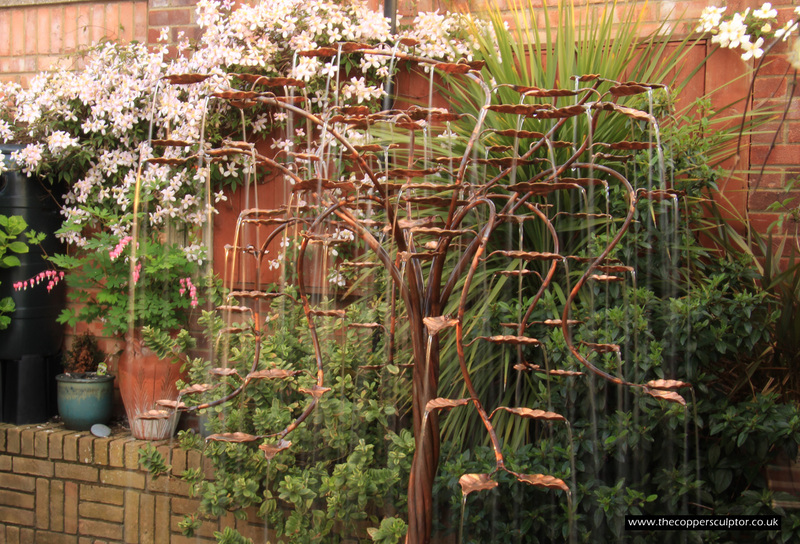 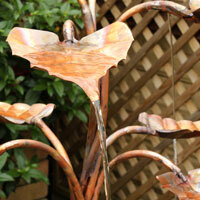 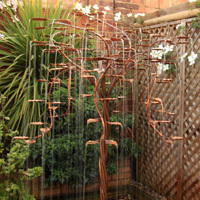 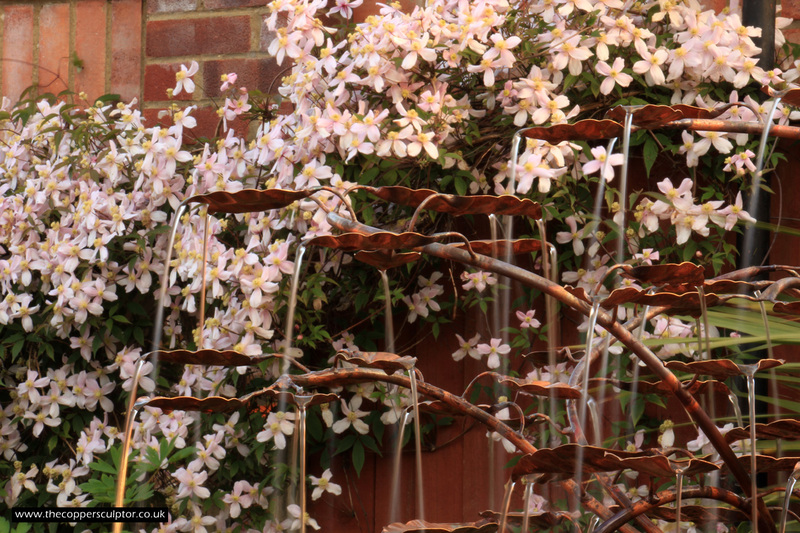 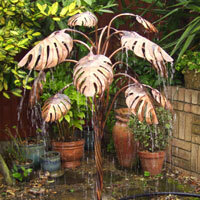 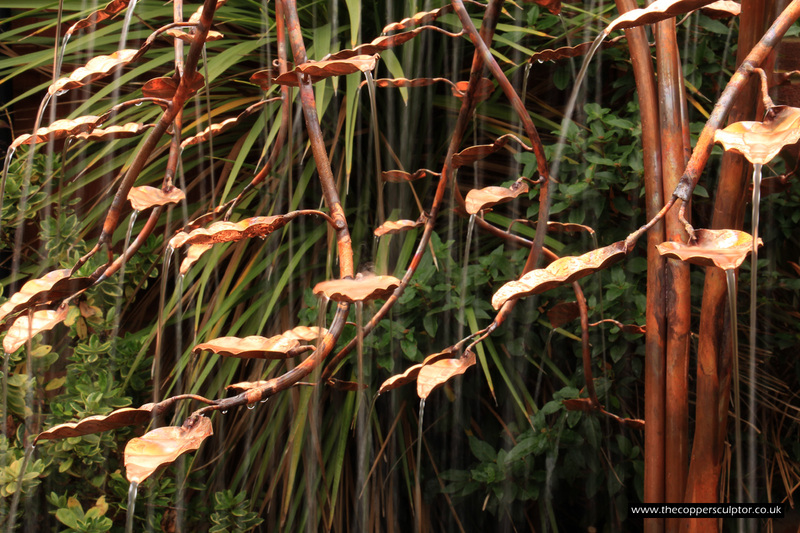 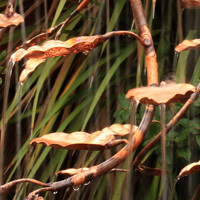 Copper Tree Water Feature. 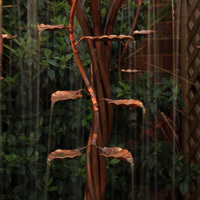 Height 1200mm, 55 water fed leaves. 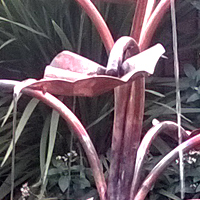 Item no 4.5/12/bb Arum Lily Bird Bath Water Feature. 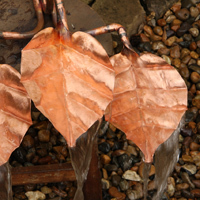 Height 1200mm, width 600mm, 8 water fed leaves. 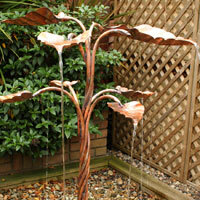 Item no 7.5/22/bb Arum Lily Bird Bath Water Feature. 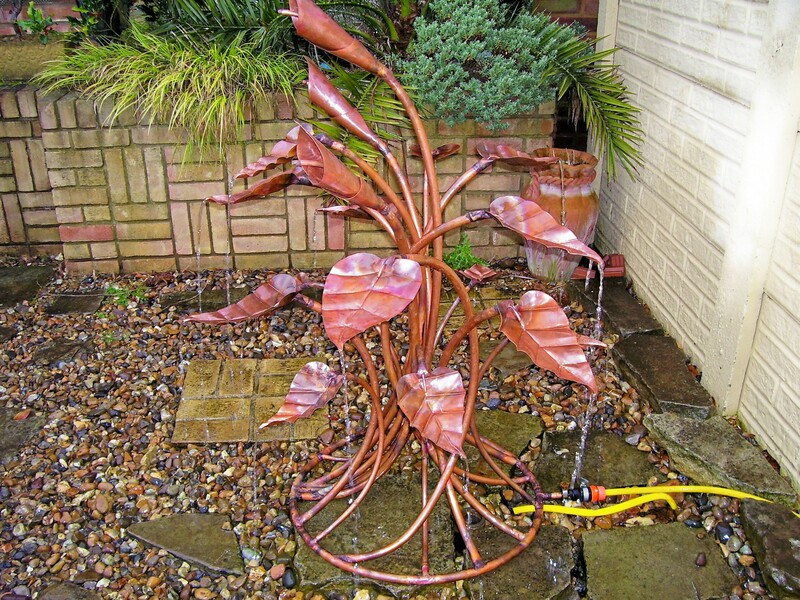 Height 1500mm, width 900mm, 16 water fed leaves. 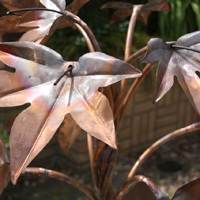 This feature evolved from the smaller lily you see above, the client asked for double the leaves and larger dimensions. 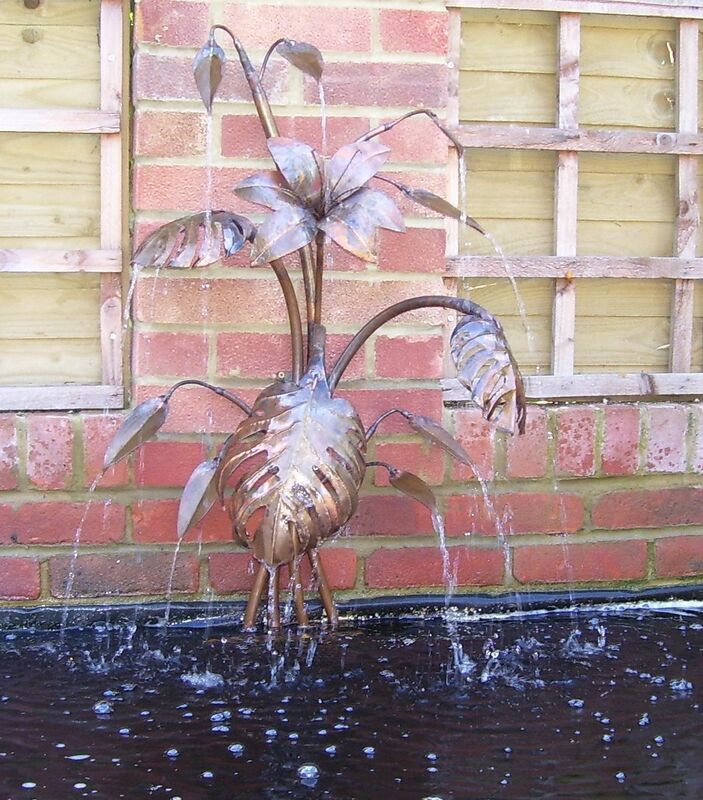 Item no 36/7.6 AR Cheese Plant Water Feature. 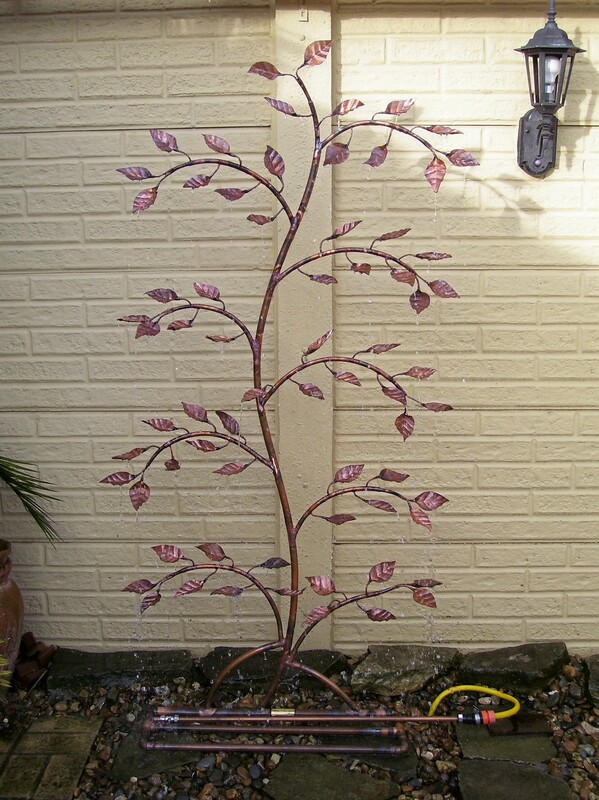 Height 1300mm, Width 850mm, Depth 850mm 14 water fed leaves. 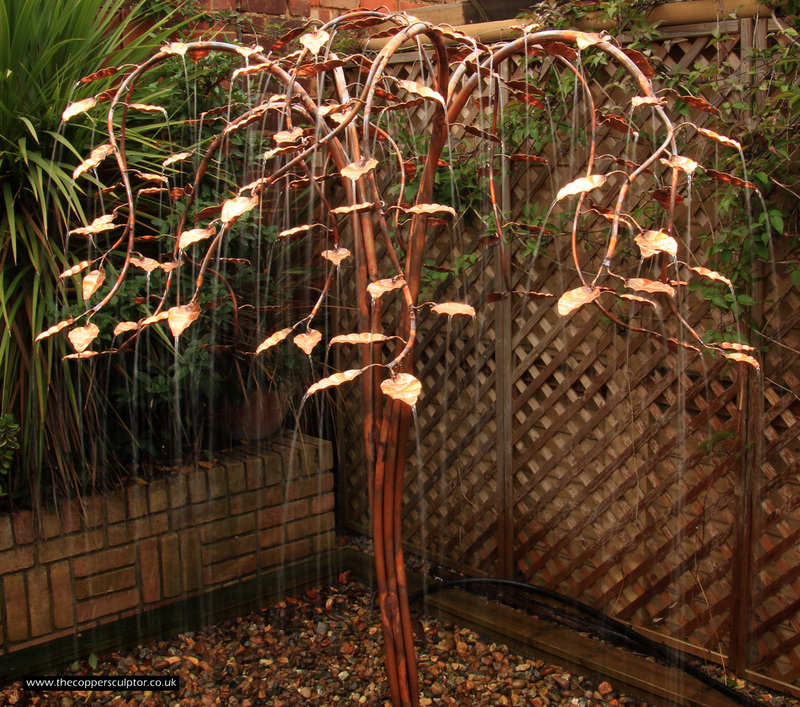 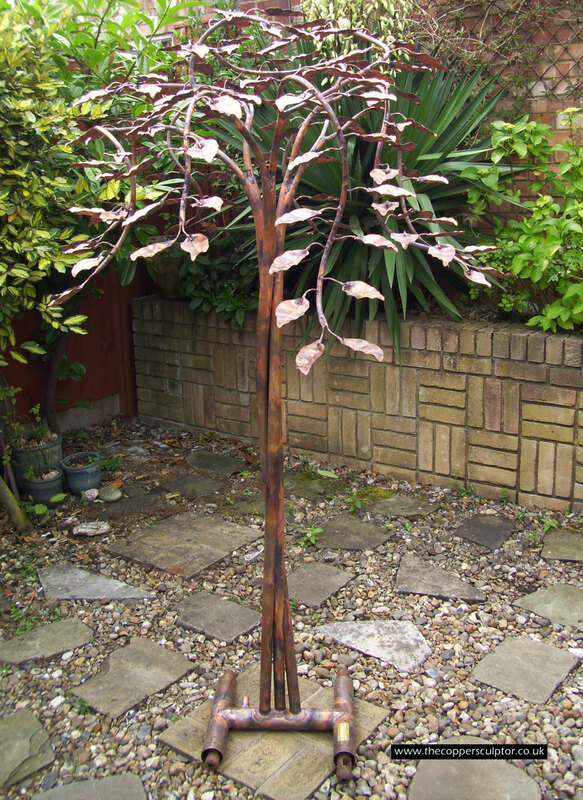 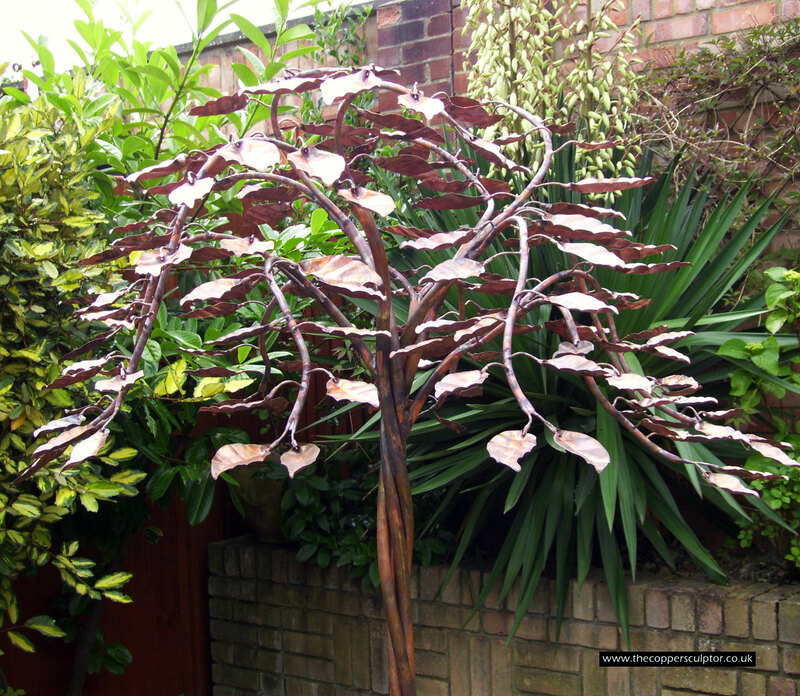 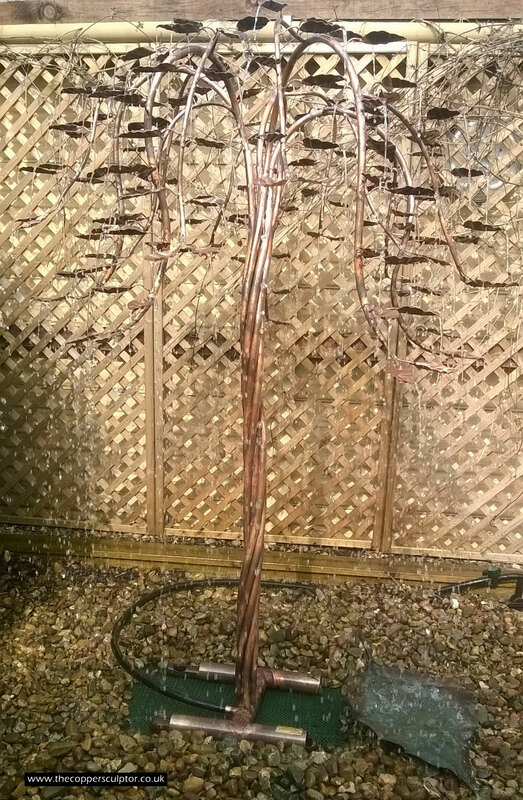 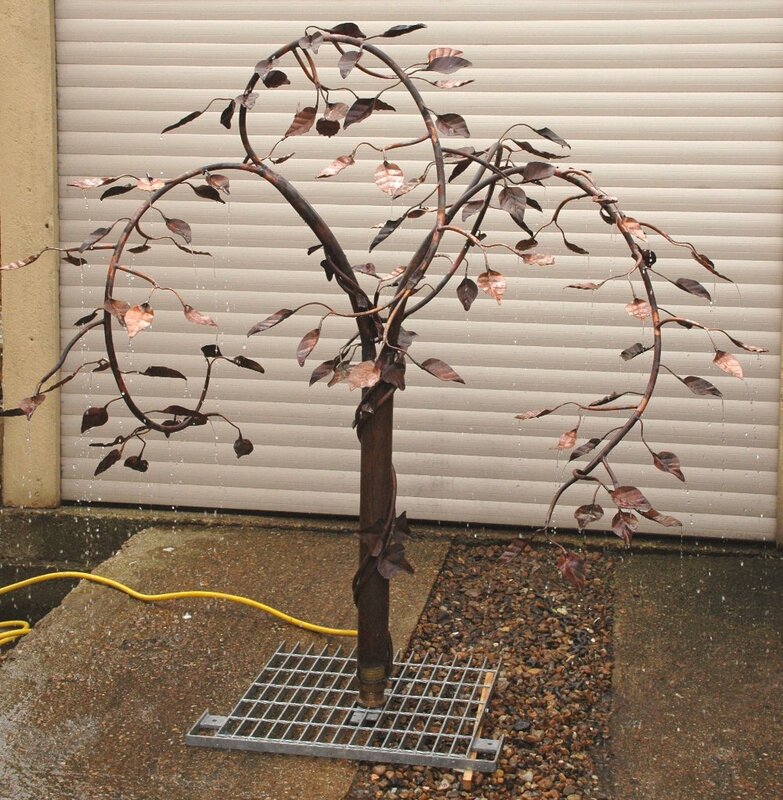 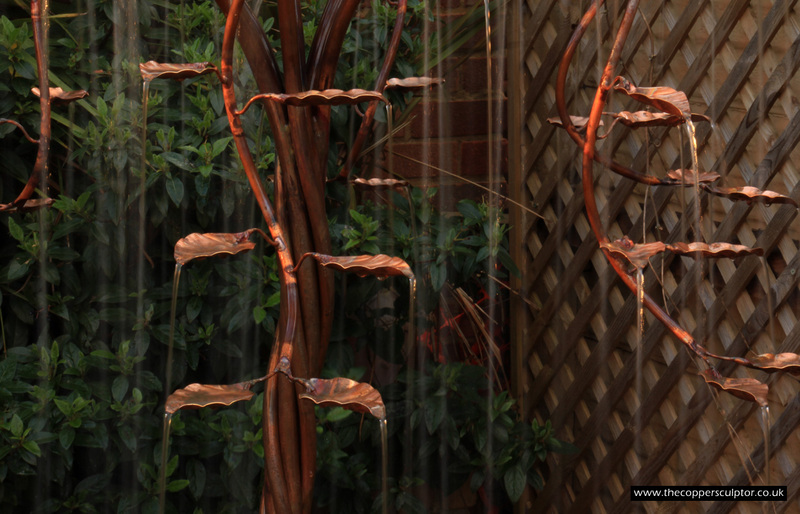 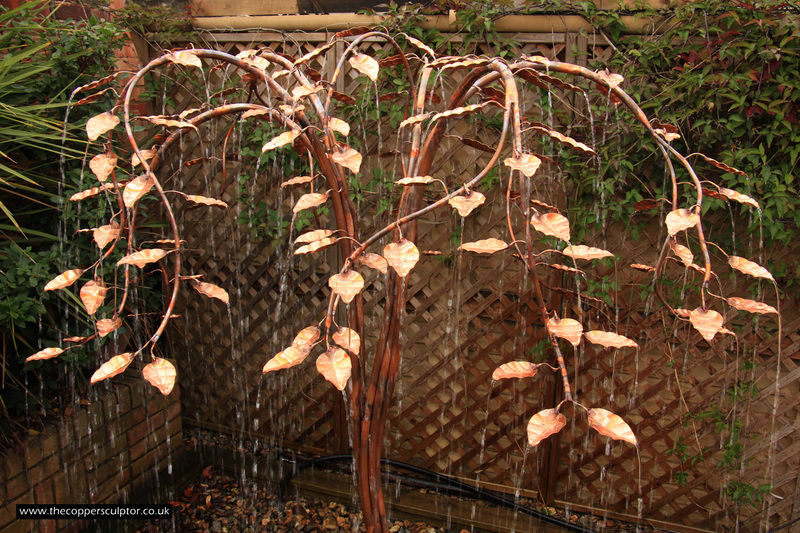 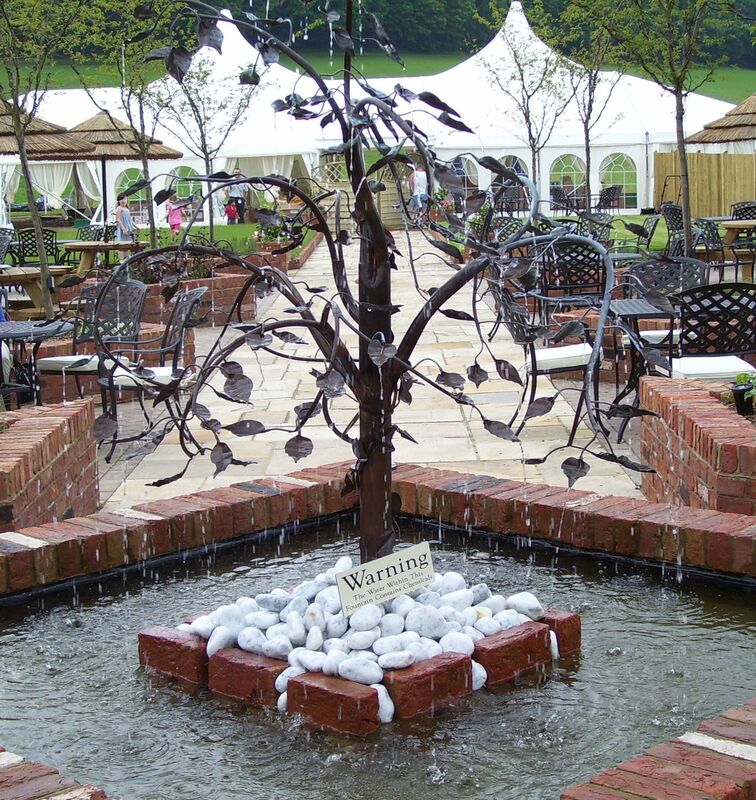 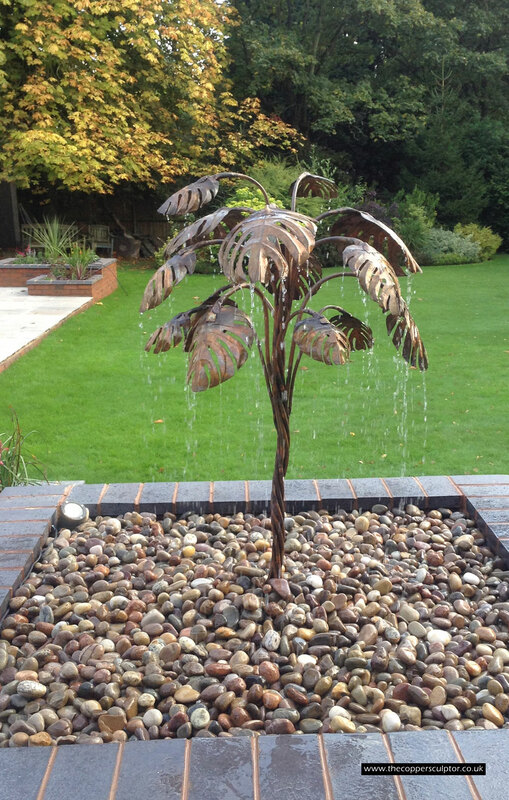 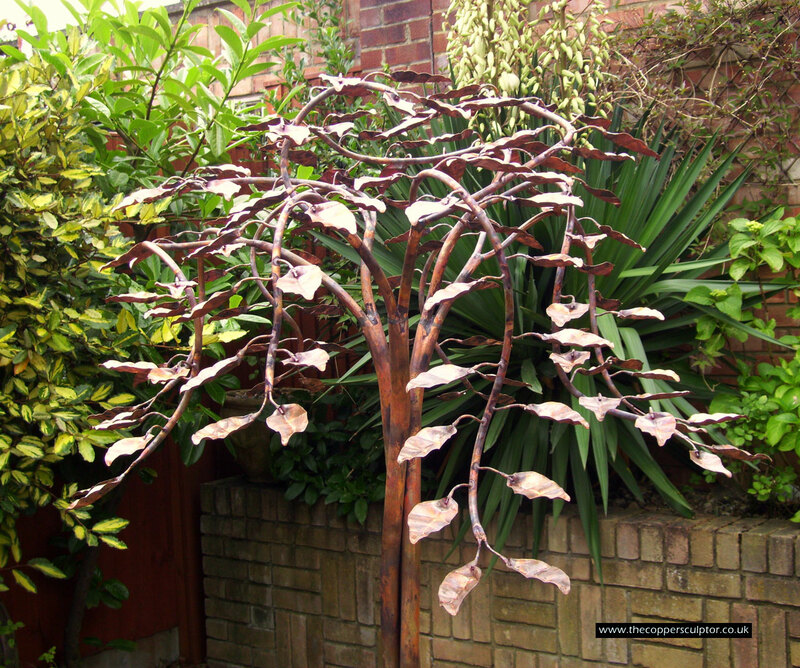 Item no 31/9.2AR Copper Tree Water Feature Height 1750mm, Width 1000mm, Depth 1000mm 135 water fed leaves, triple 28mm twisted trunk. 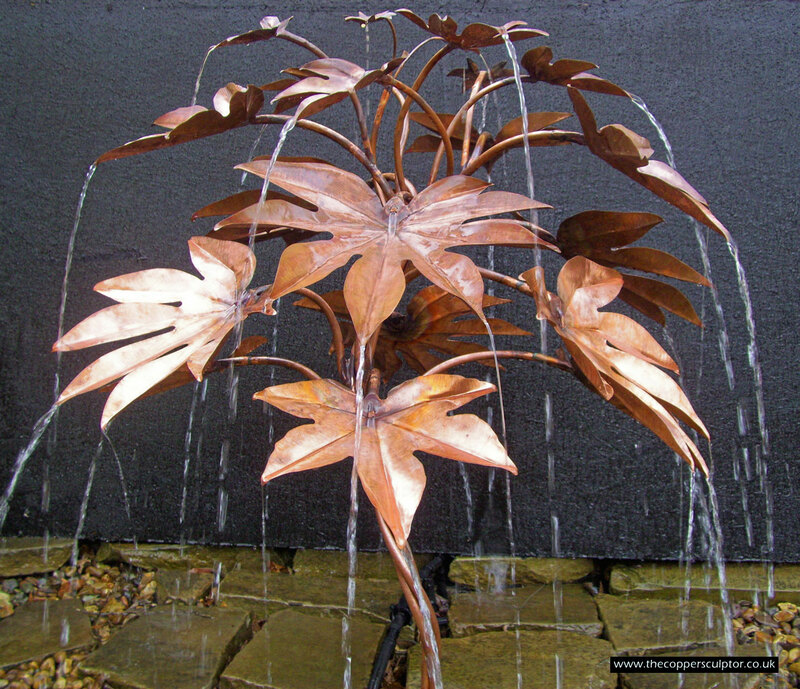 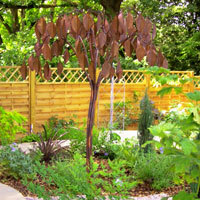 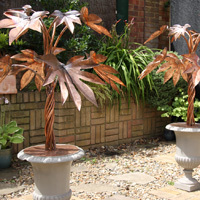 Item no 35/11 AR/BL Copper Tree Water Feature Height 1800mm, Width 1100mm, Depth 1100mm 160 water fed leaves (larger at the centre), quadruple 19mm twisted trunk, all round aspect. 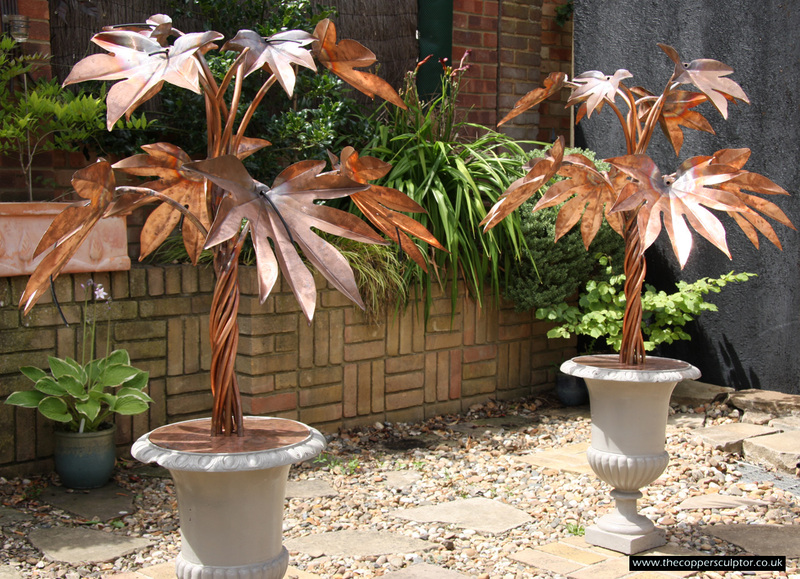 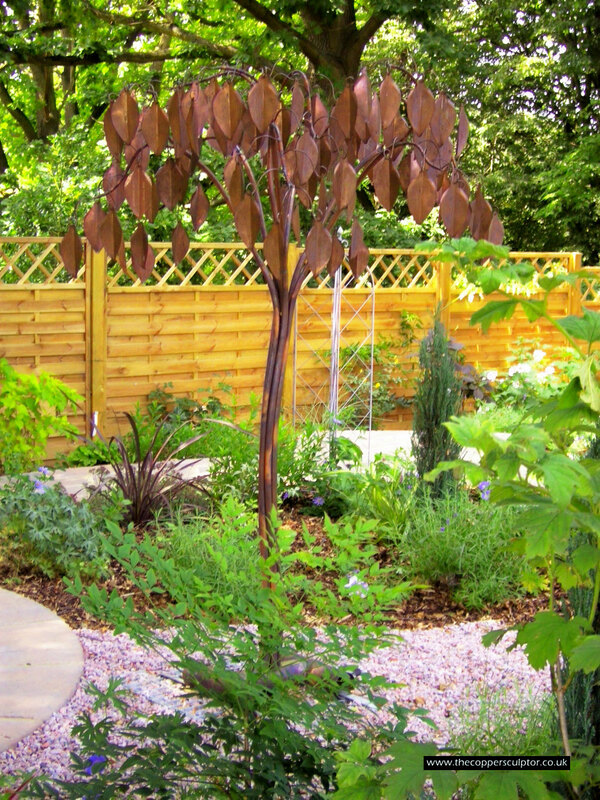 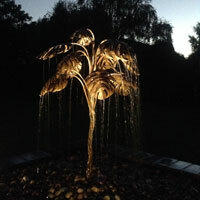 Item no 35/11 FF/BL Copper Tree Water Feature Height 2000mm, Width 1250mm, Depth 400mm approx 160 water fed leaves, quadruple 19mm twisted trunk, front facing. 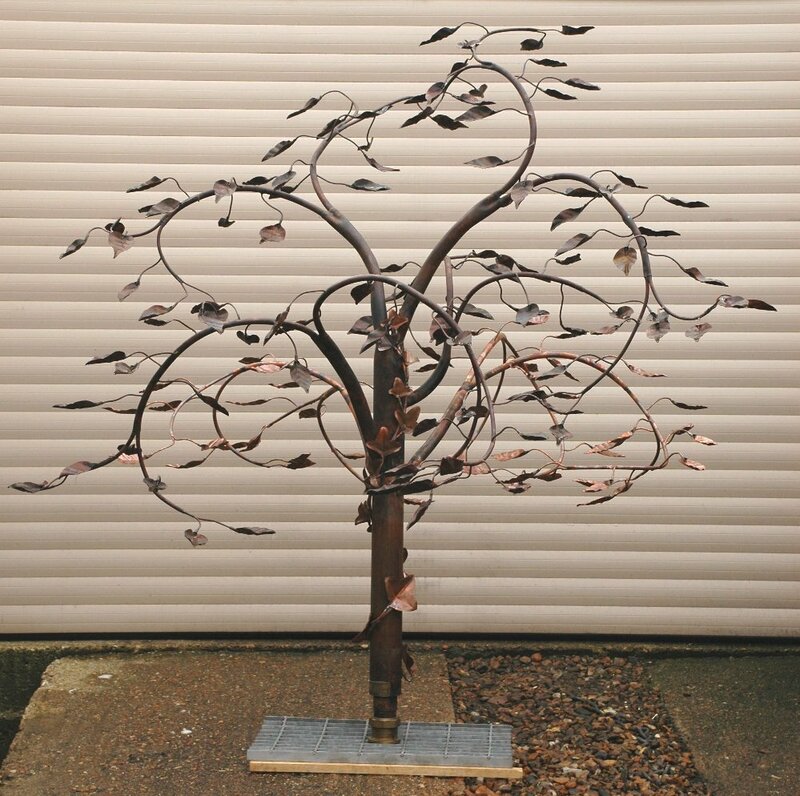 Item no 27/9 AR Height 5.5 ft, Width 3.5 ft, Depth 3.5 ft 120 water fed leaves, 33 of which are are the new larger leaf situated towards the centre of the tree and make the feature look more striking. 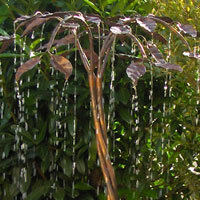 Item no 30/10 AR Height 1500mm, Width 1000mm, Depth 1000mm 134 water fed leaves. 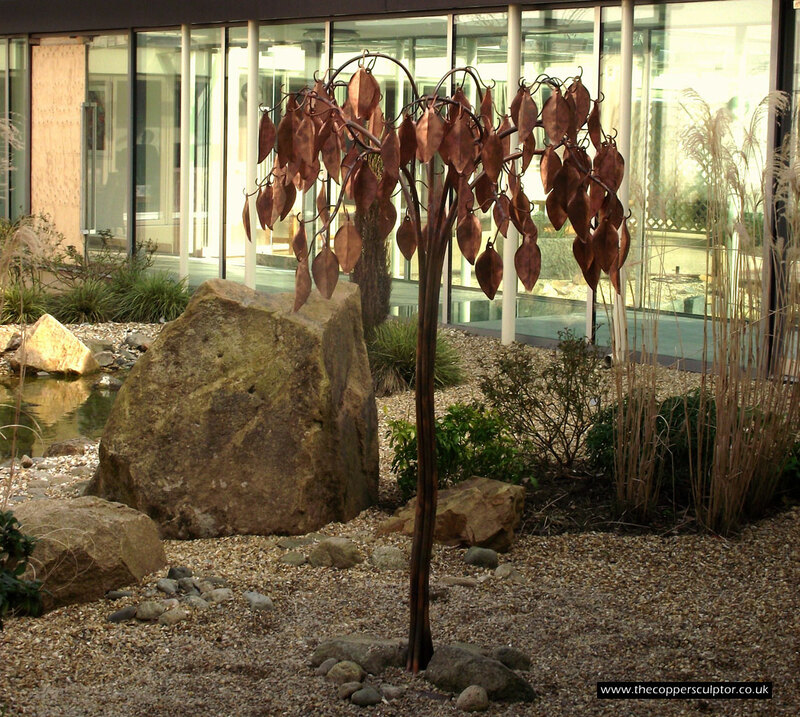 Colin lives and works around the Buckinghamshire area, close to Chalfont and Beaconsfield and was kind enough to send me these photos. 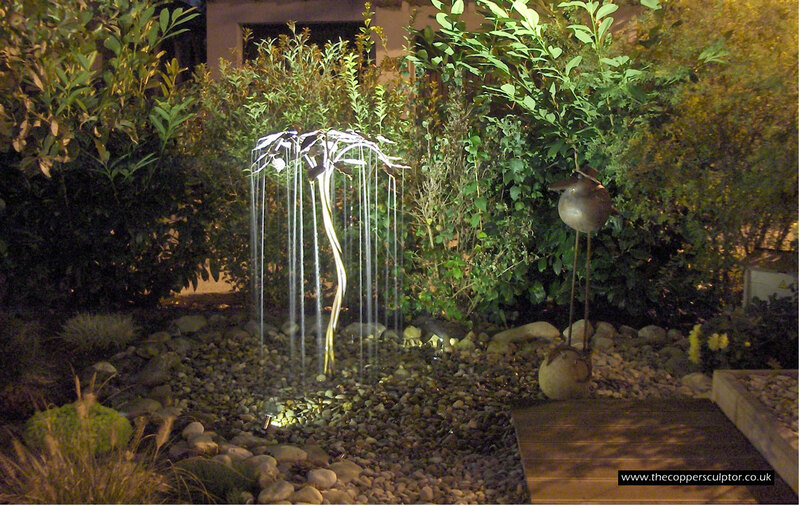 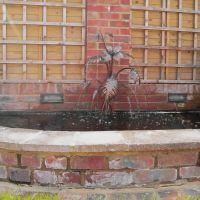 I recently delivered this water feature to Greater Manchester on June 2012. www.mdshomeandgarden.co.uk made a beautiful job of fitting it for my client and were kind enough to send me these photos. 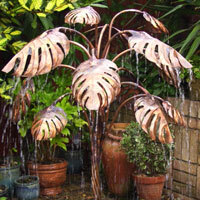 Item no 01/.03FF Arum Lily straight leaves, ideal to feed a pond, similar to the feature below. 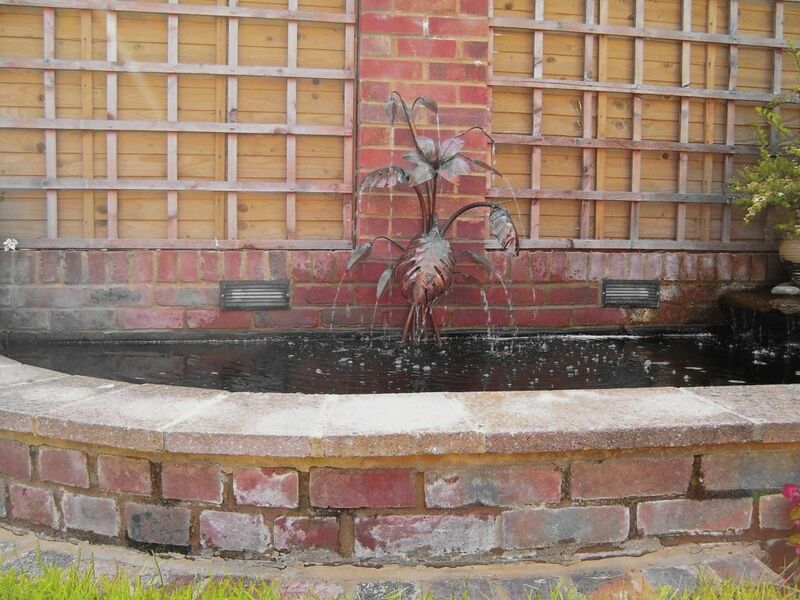 Item no 02/1FF This feature is best suited to be built into a wall or rockery to feed a pond. 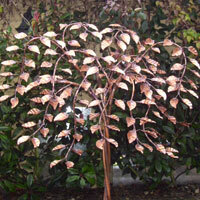 It has three water feed beech leaves . 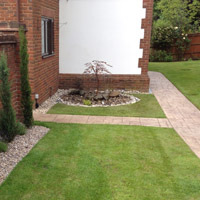 The overall dimensions are 1' in depth and 1'6" in width. 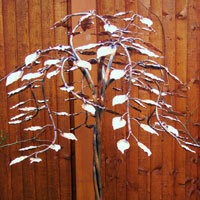 If you need more leaves, simply add £50.00 per leaf. 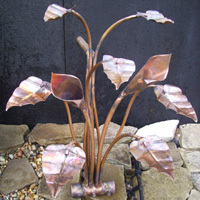 Item no 12/7FF Front Facing Arum Lily. 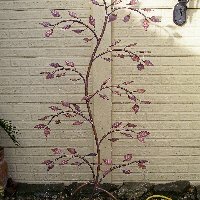 3' in height, 3' in width. 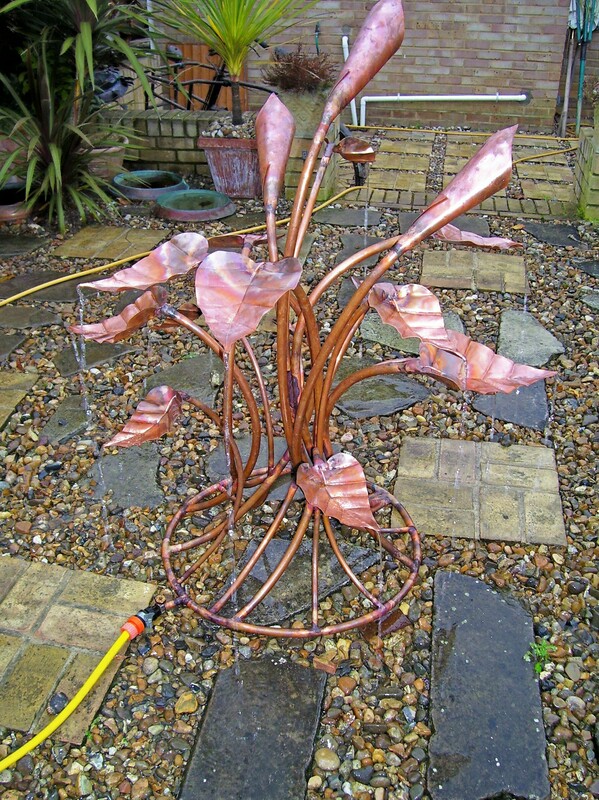 The customer needed this feature to be feed from half way up lily as opposed to at the base. 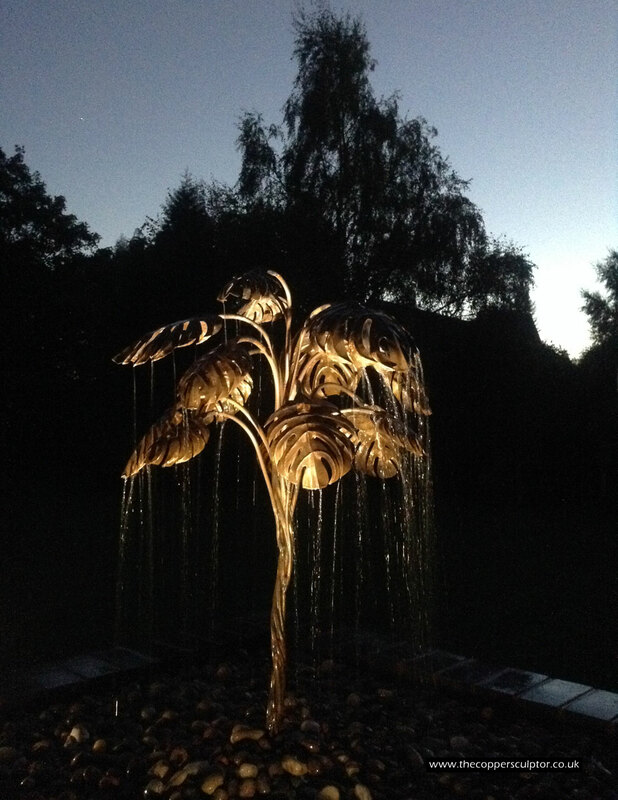 This is the beauty of a bespoke feature. 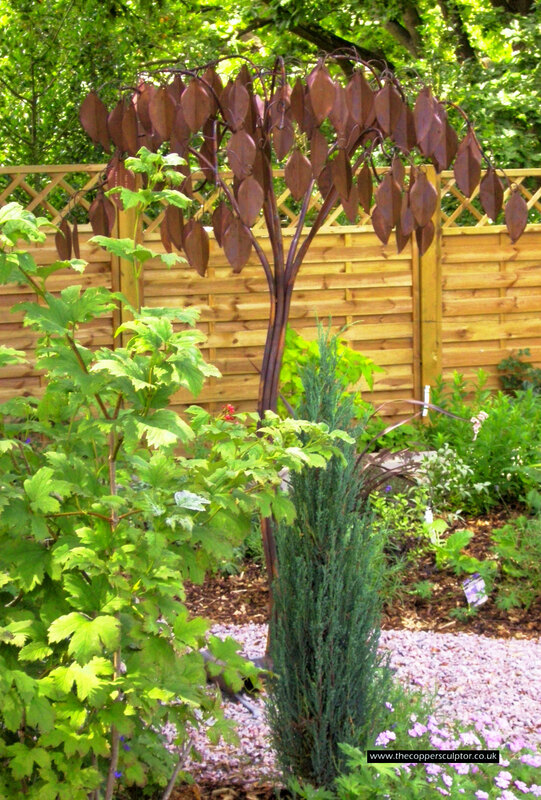 Display Tree. 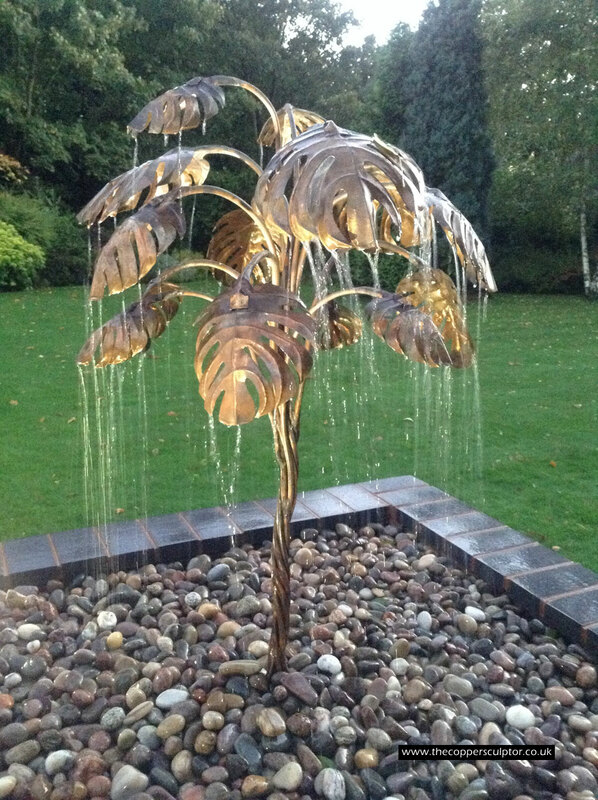 This commissioned water feature was designed for a new funeral director's premises, the unusual dimensions of 5' height, 4'2" width and 1'2" depth were specified for the display. 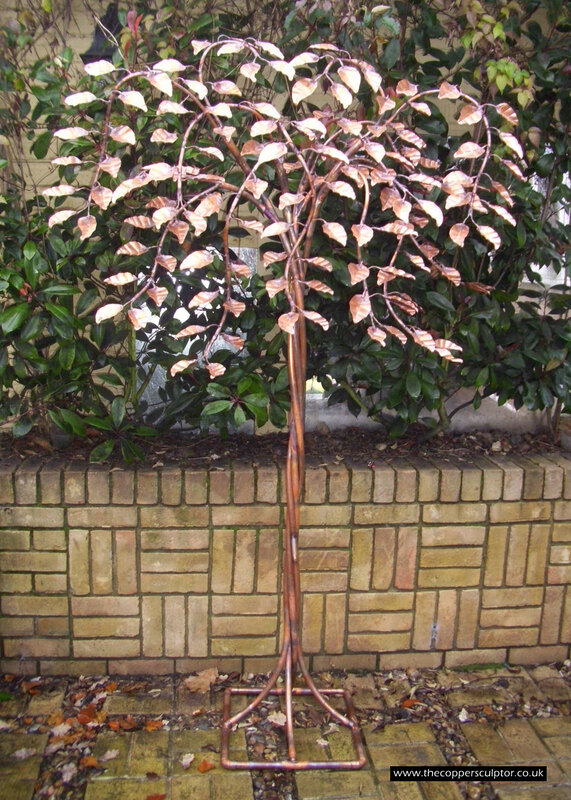 The impressive width gives room for 80 water fed beech leaves. 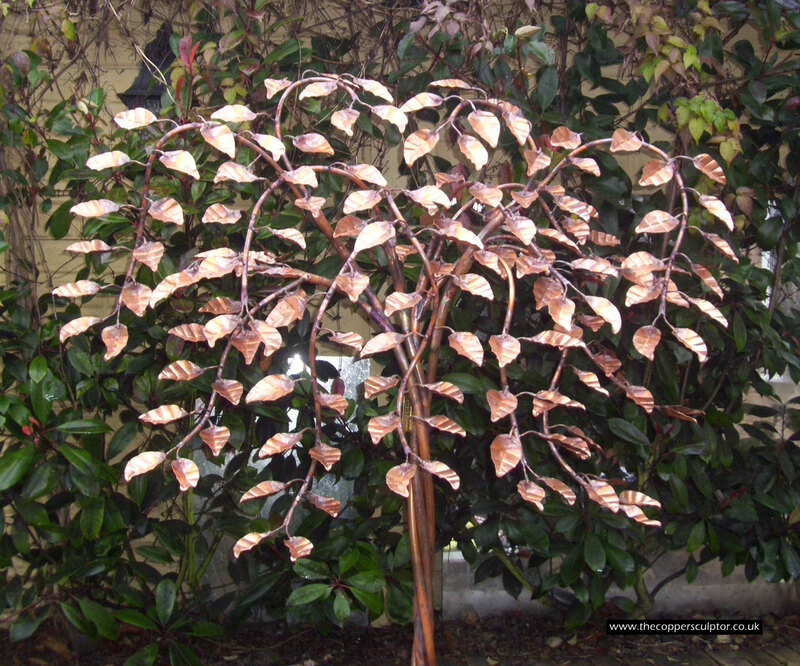 Display Tree. 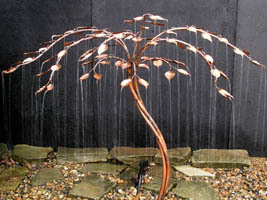 A similar design to the display tree above, a larger size was specified. 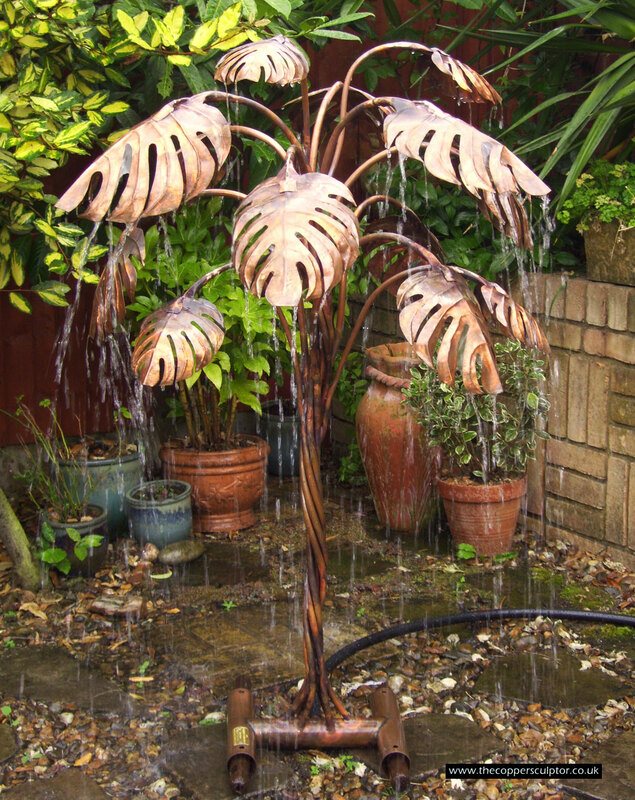 5' height, 4'4" width and 2' depth. 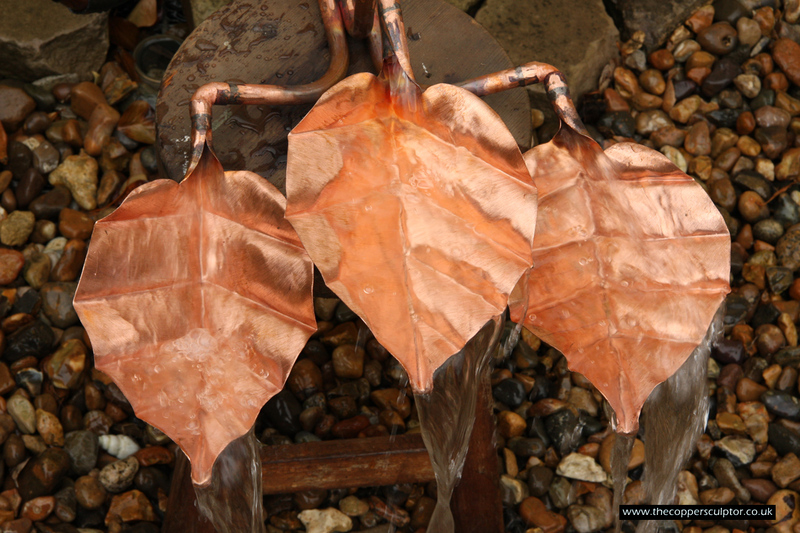 120 leaves, all water fed. 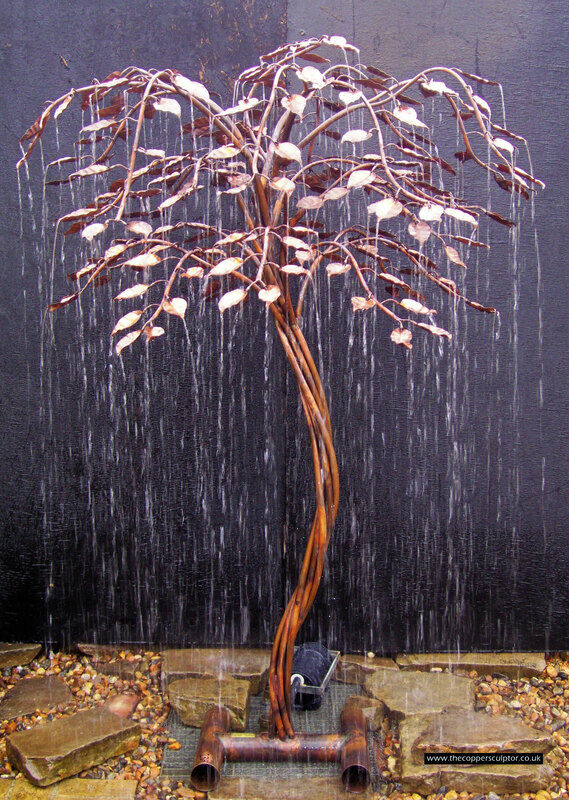 Memorial Tree. 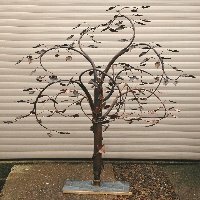 This was a commissioned tree for a lady who wanted a memorial for her daughter. 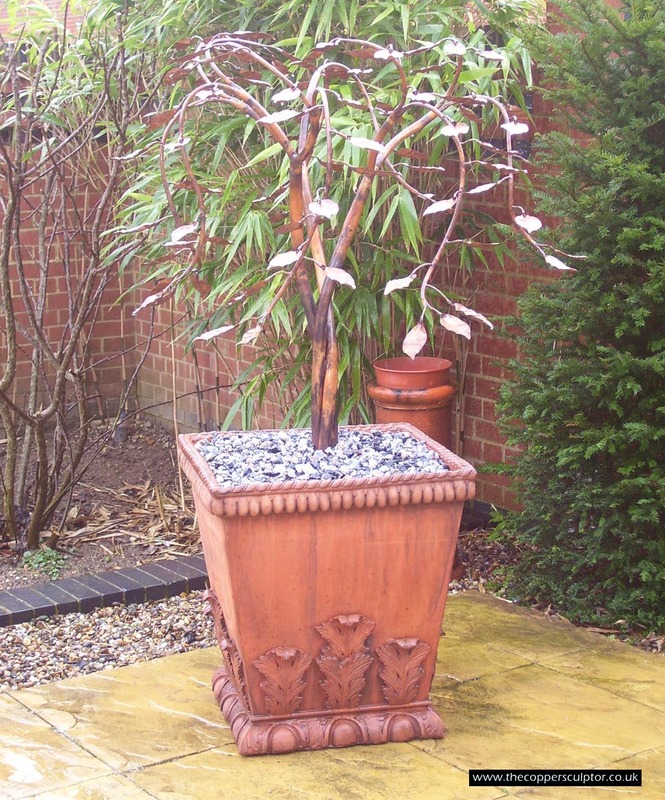 She chose a french terracotta pot which complimented the tree from a local garden centre which also stocks a wide range of beautiful pots including Indian sandstone. 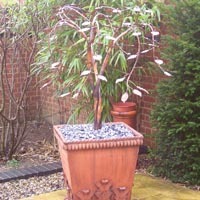 The customer was very pleased with the finished memorial, giving her an elegant container for the urn. 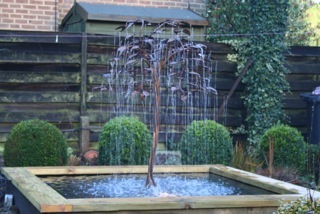 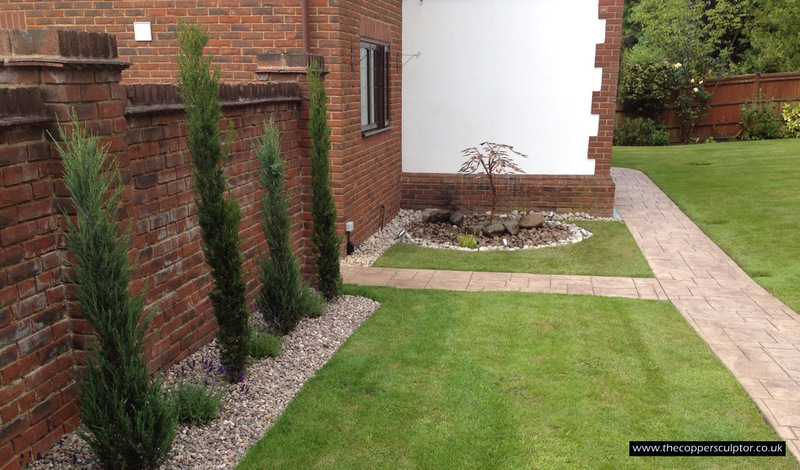 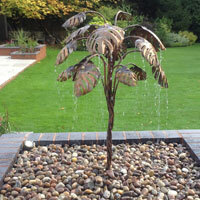 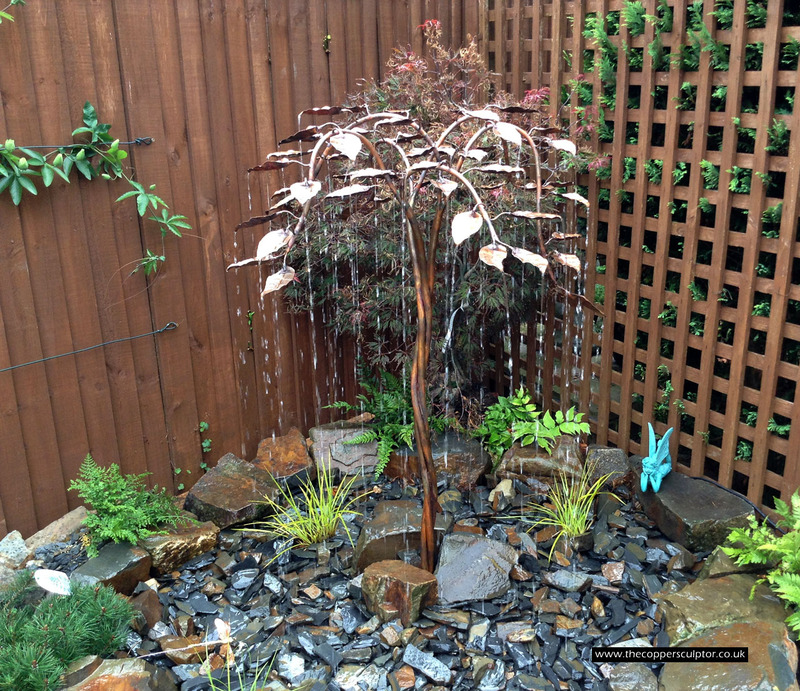 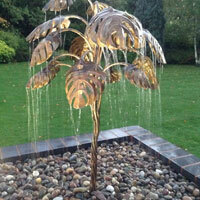 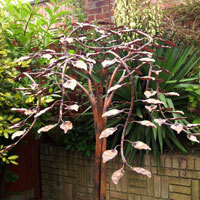 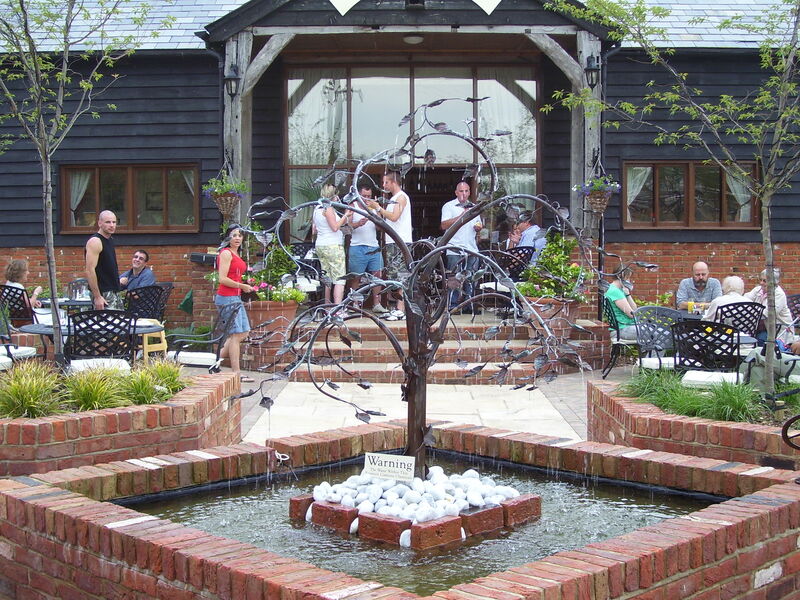 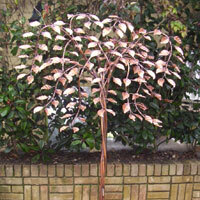 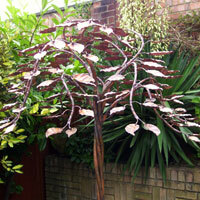 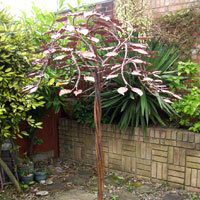 This tree was originally built as a functioning water feature, the pot was sourced by the client. 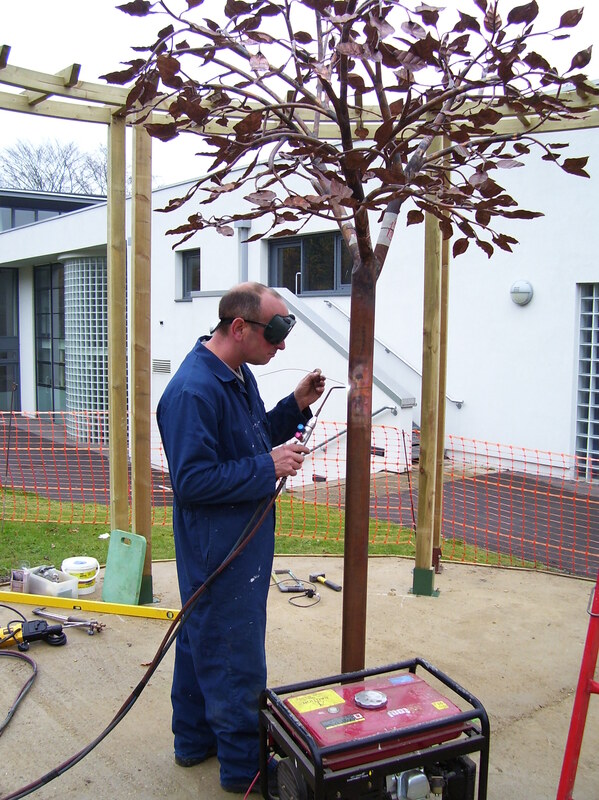 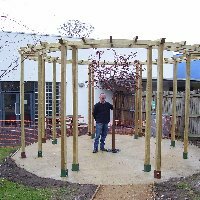 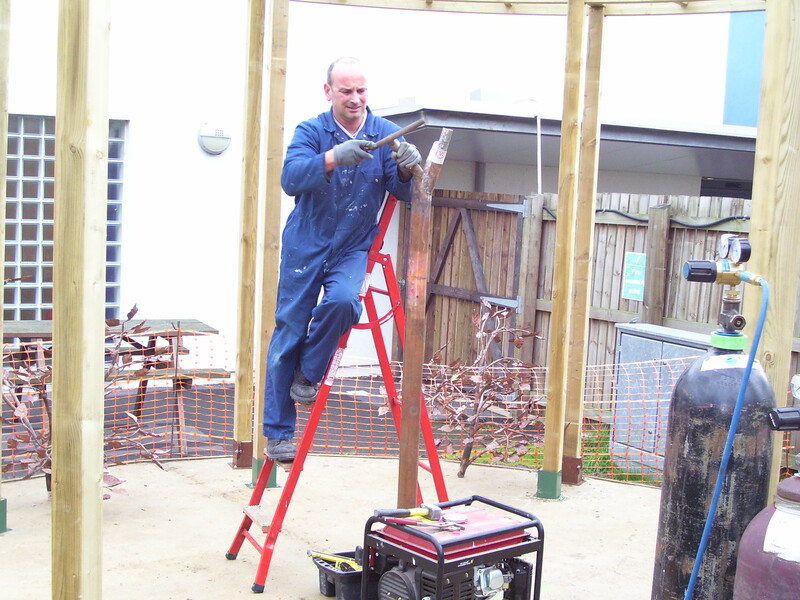 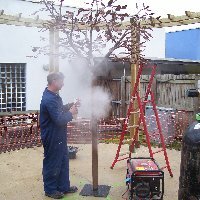 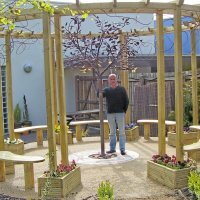 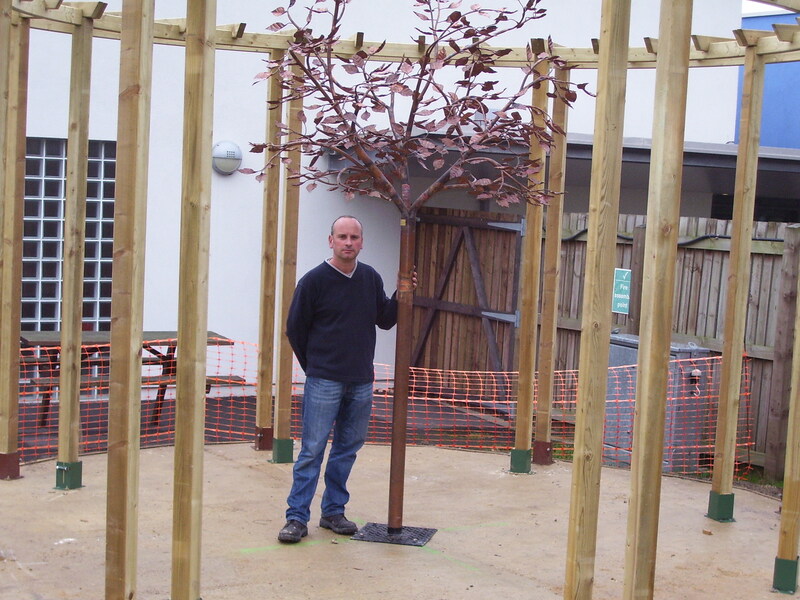 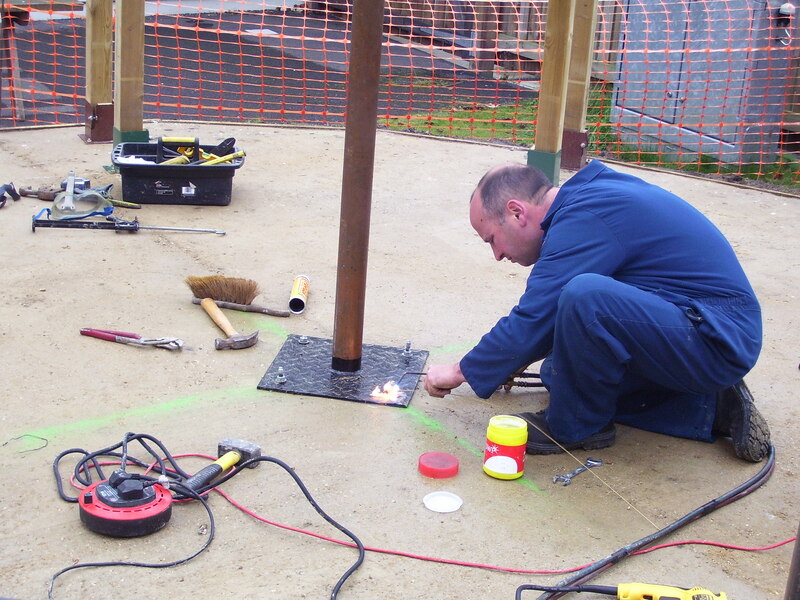 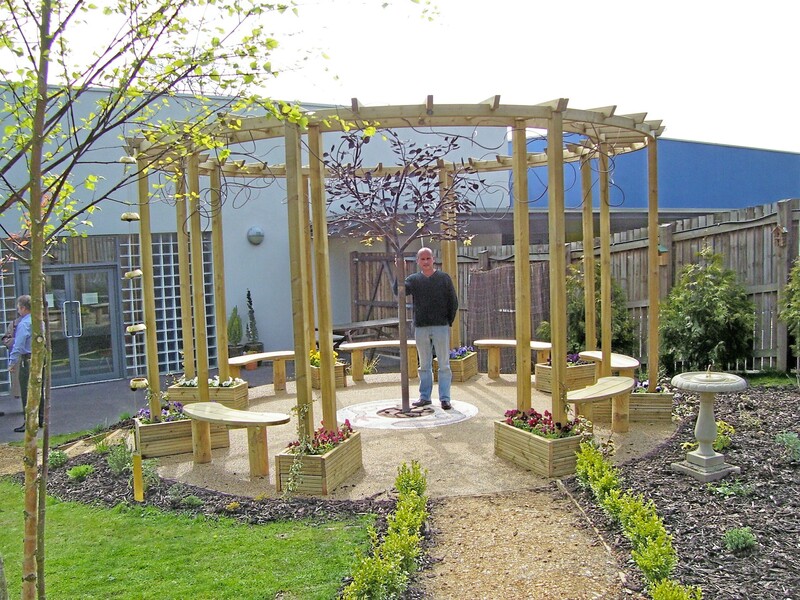 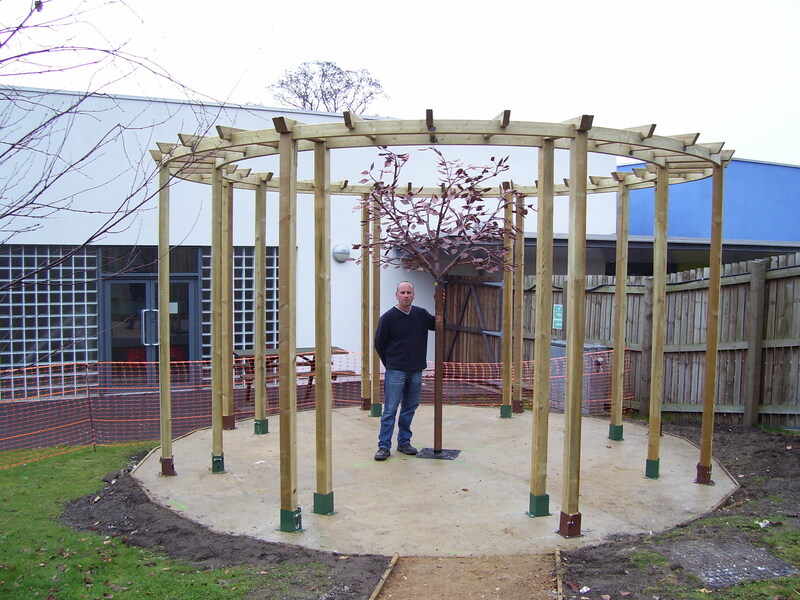 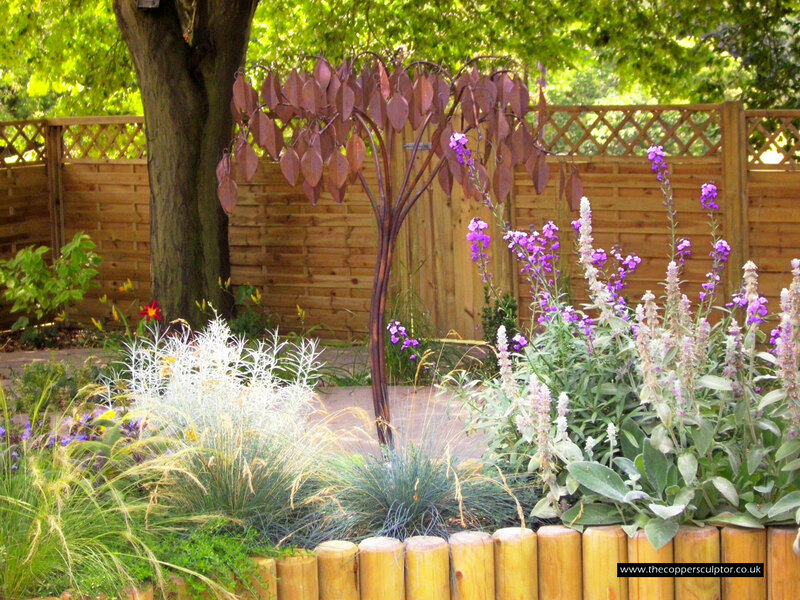 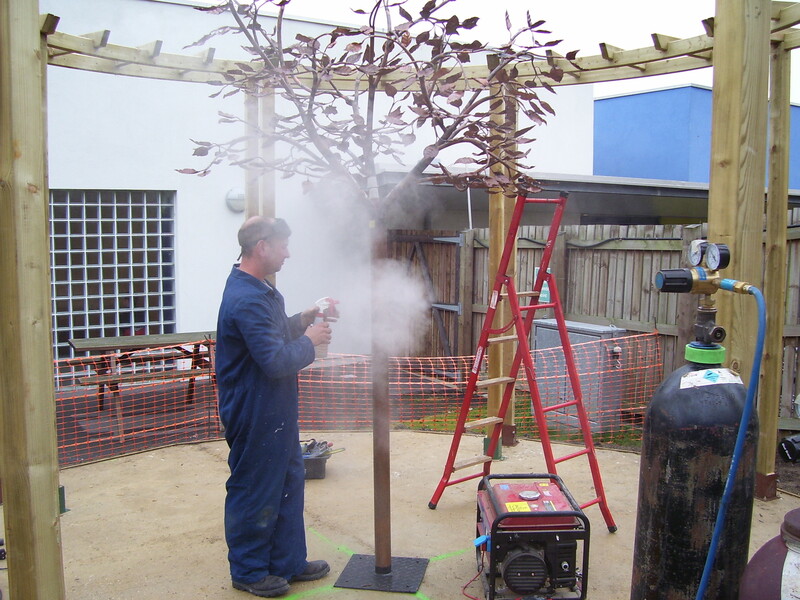 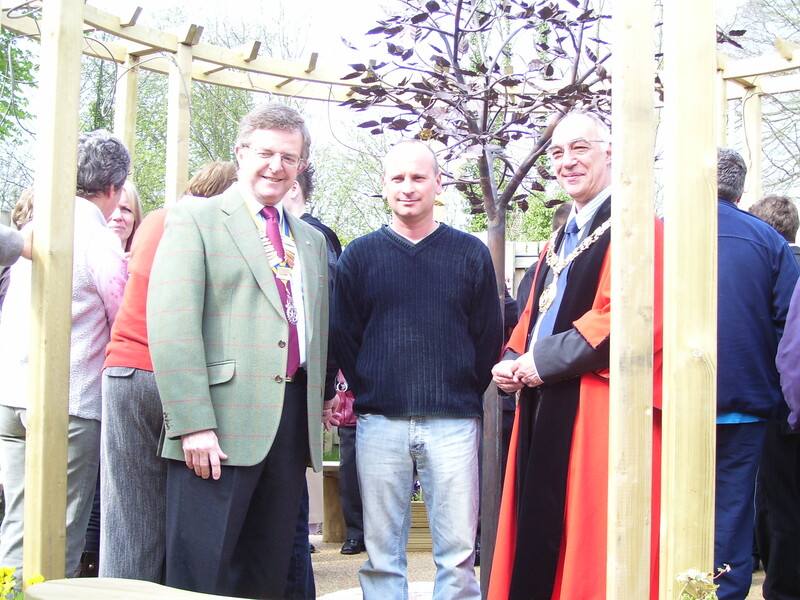 Paul designed, built and installed this memorial tree for a private school in the south of England. 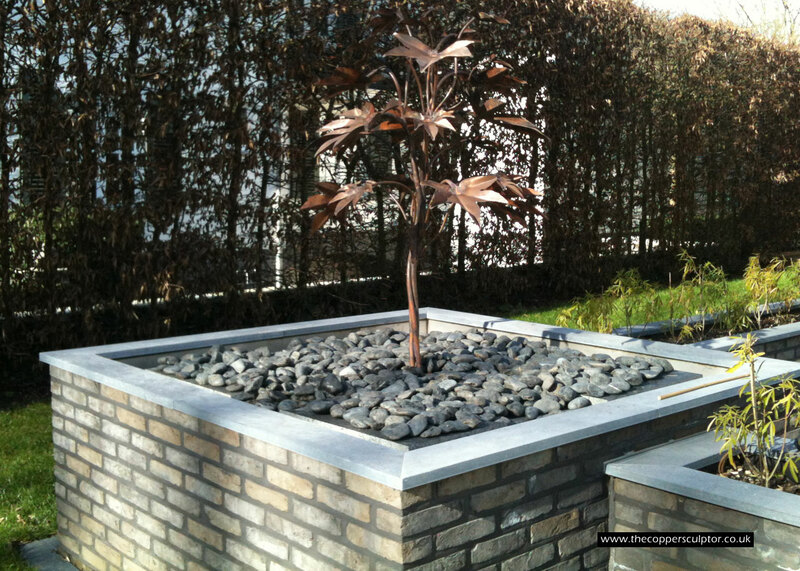 Item no 37/16 AR / Memorial. 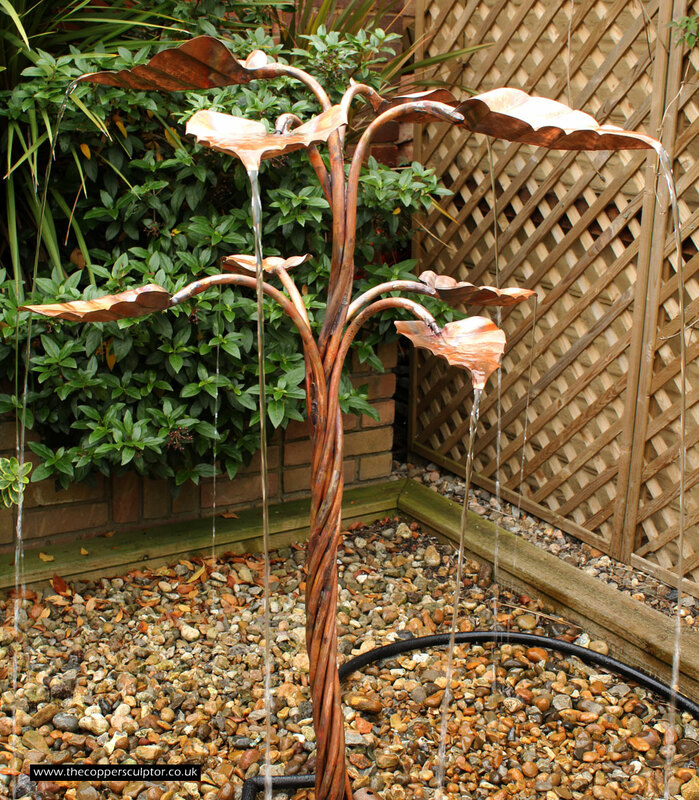 Height approx 6', width approx 4' This sculpture was commissioned by a Kent hospice. 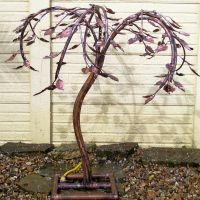 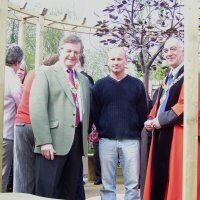 It is a memorial fund raising tree, the leaves are all detachable and will be engraved with the appropriate inscription. 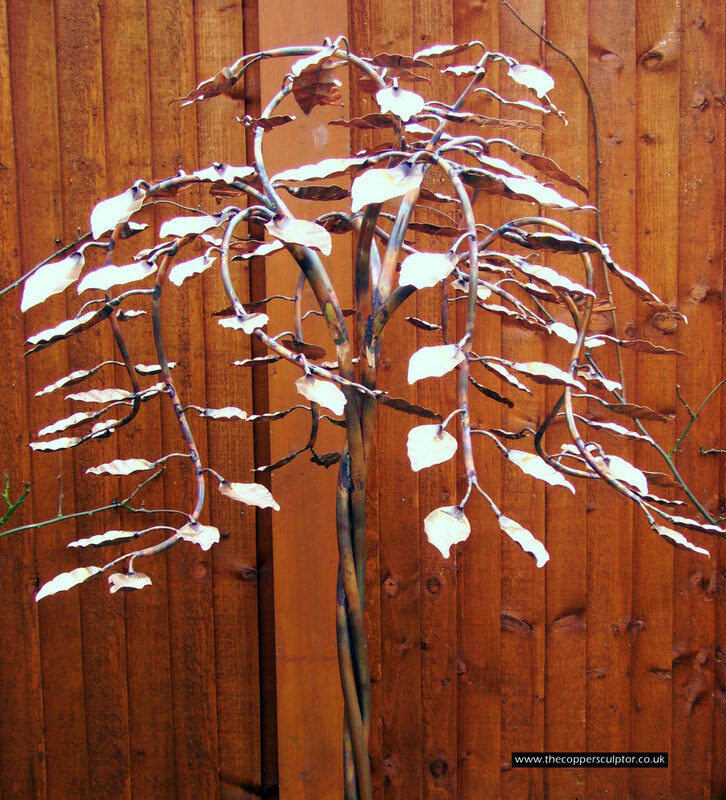 I believe the idea is that if you were impressed with the care your loved one received and you wished to make a donation this would allow you to commemorate that person on one of the trees leaves. 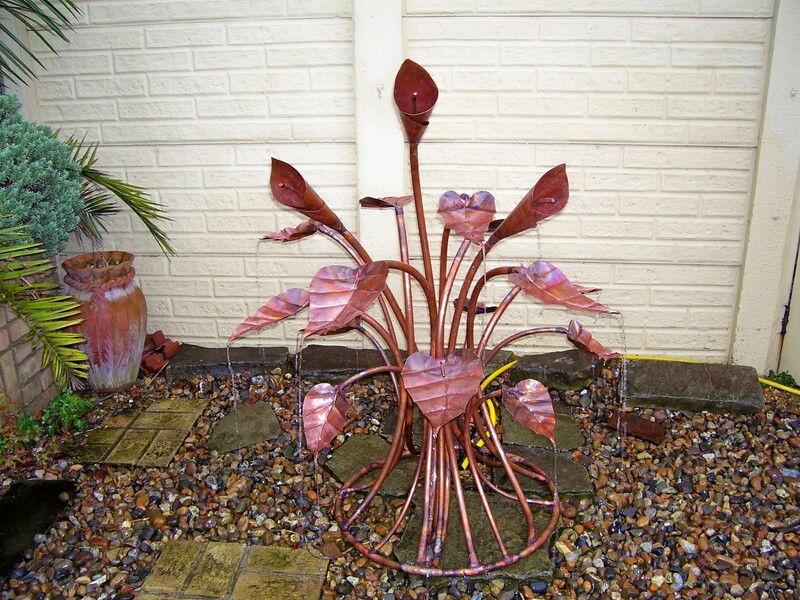 Large Cheese Plant. 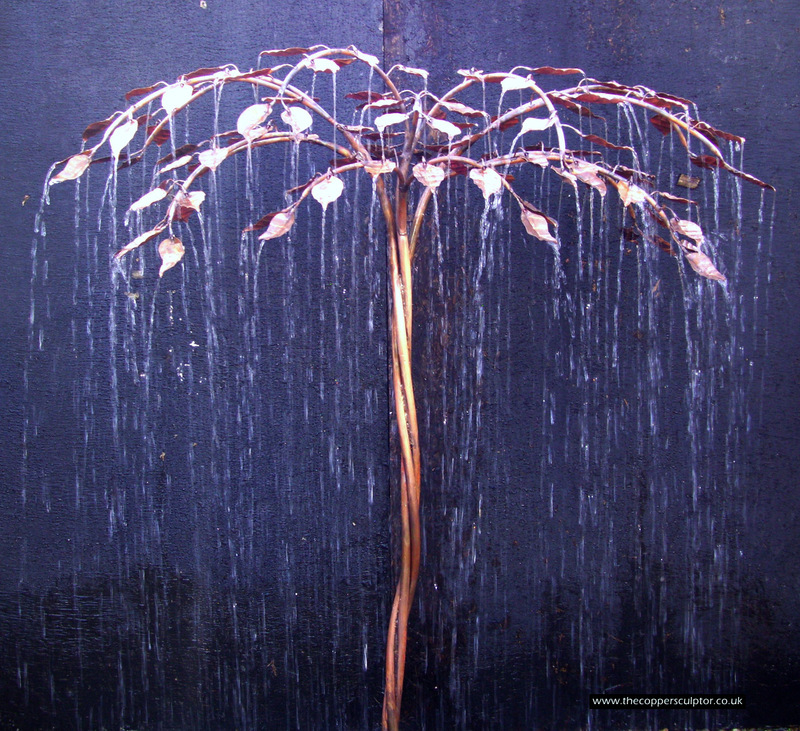 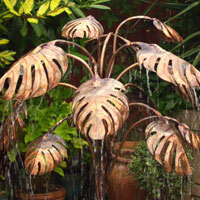 This commissioned sculpture stands 68" in height and 40" in width and has 18 water feed leaves. 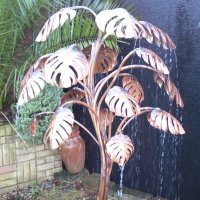 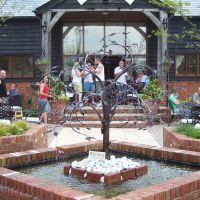 The customer requested a water feature similar to the Cheese Plant below, but enlarged to suit the dimensions of the garden. 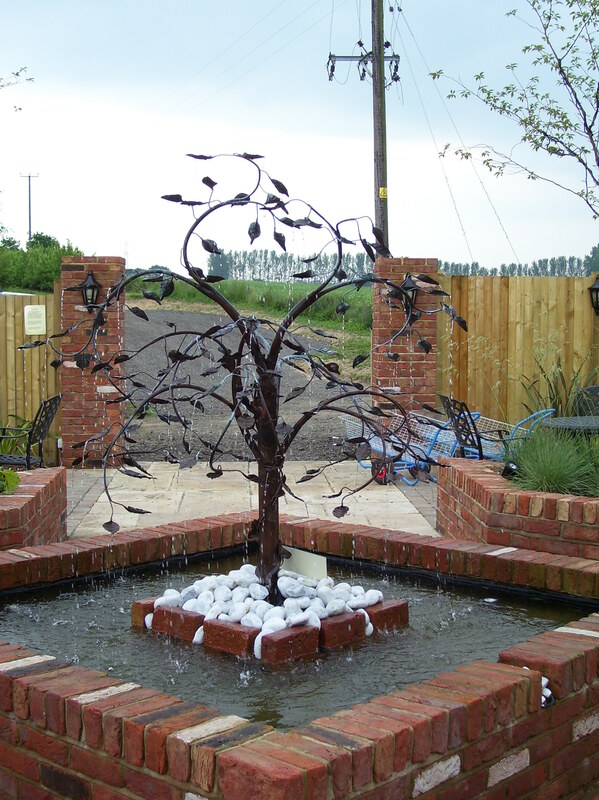 Water fed wall art made to a customer's requirements. 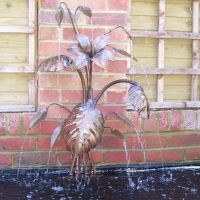 The customer wanted a sculpture similar to the 240407 Arum lily water feature but larger, to suit the dimensions of the garden. 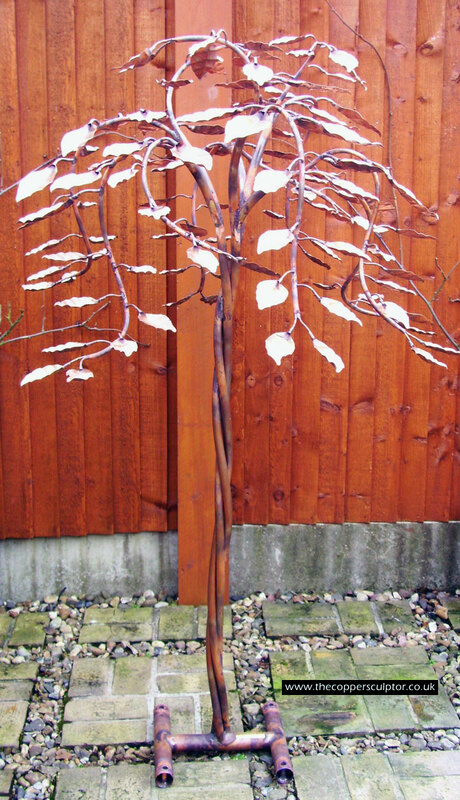 Medium sized trees, modified and enlarged. 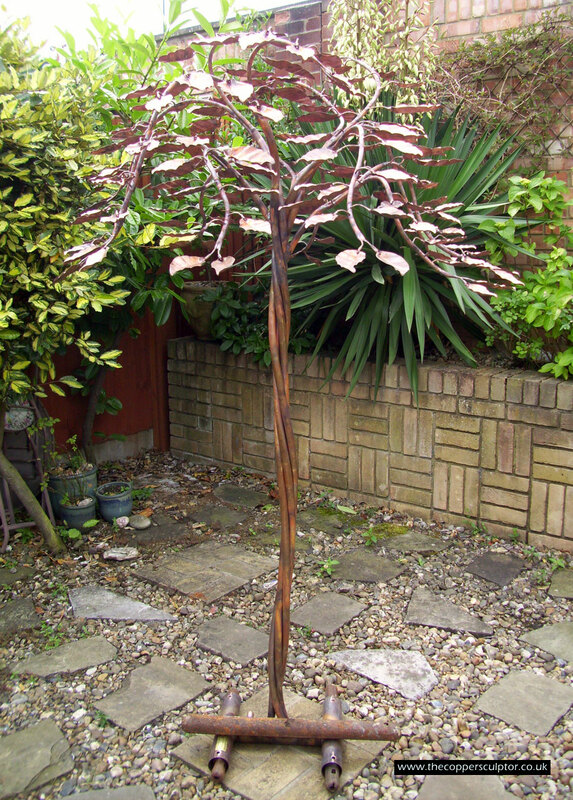 Medium sized tree (same as above, right), in situ. 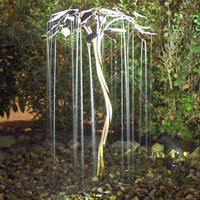 Weeping Willow. 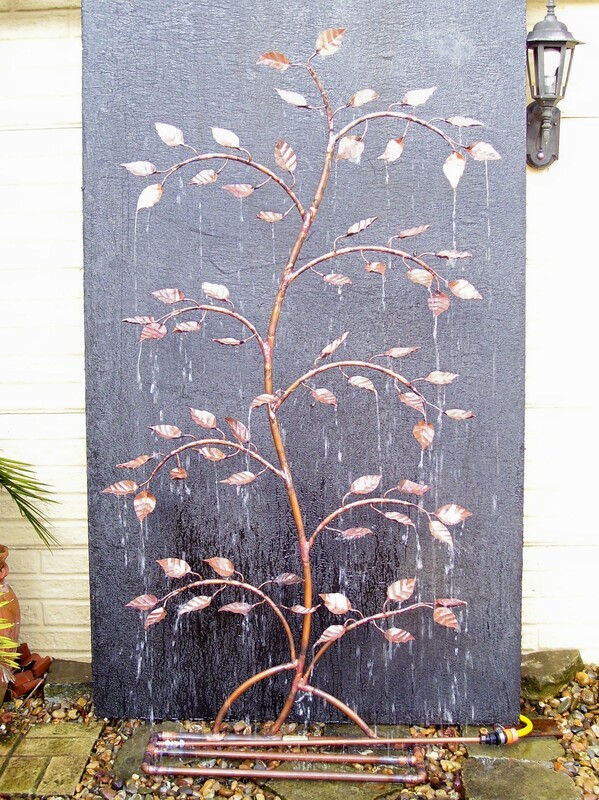 Height approx 4.3ft Width approx 3.5ft. 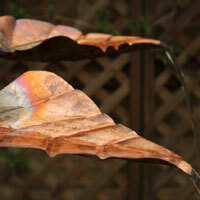 Item no 8/2.5FF This type of feature can be made in various different forms. 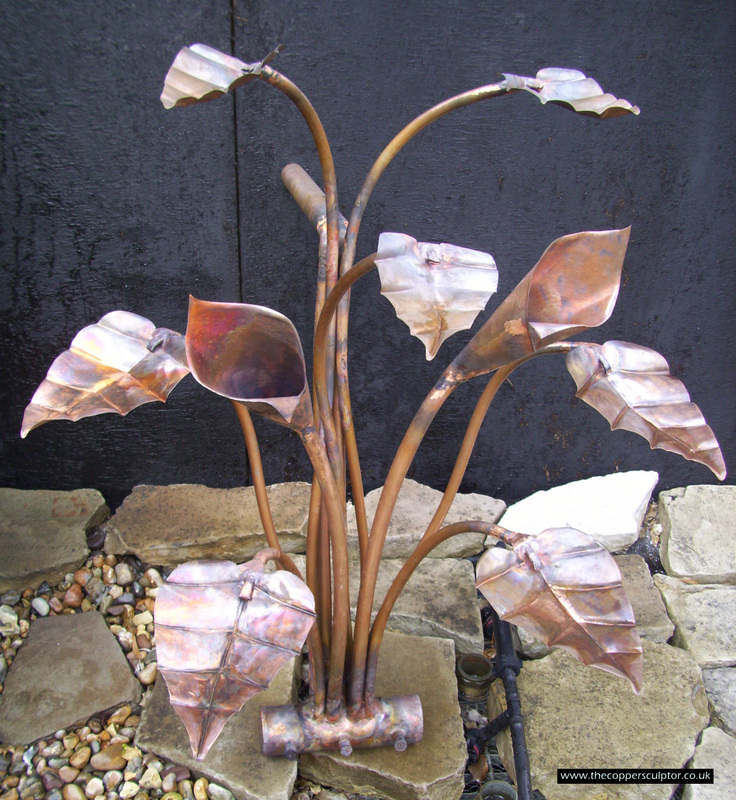 With this commission the customer requested a bunch consisting of Lily, Cheese plant and leaves to his dimensions. 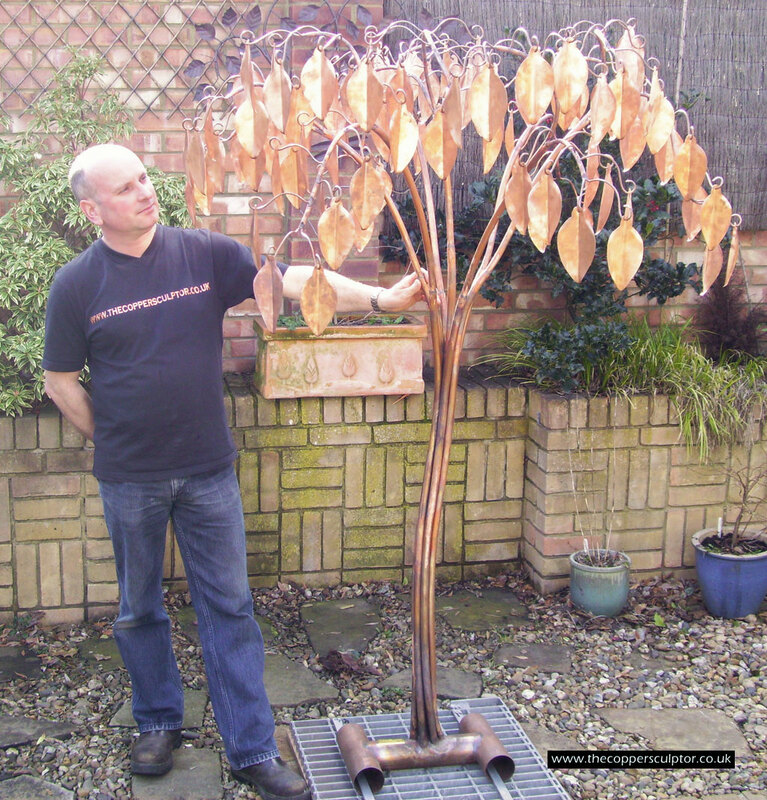 Item no 32/7.5 These two sculptures were made as a pair for a lady in the south of France, each sculpture has 10 fatsia leaves and the trunk is made up of 10 pipes twisted around each other to accommodate the 10 fibre optic cables. 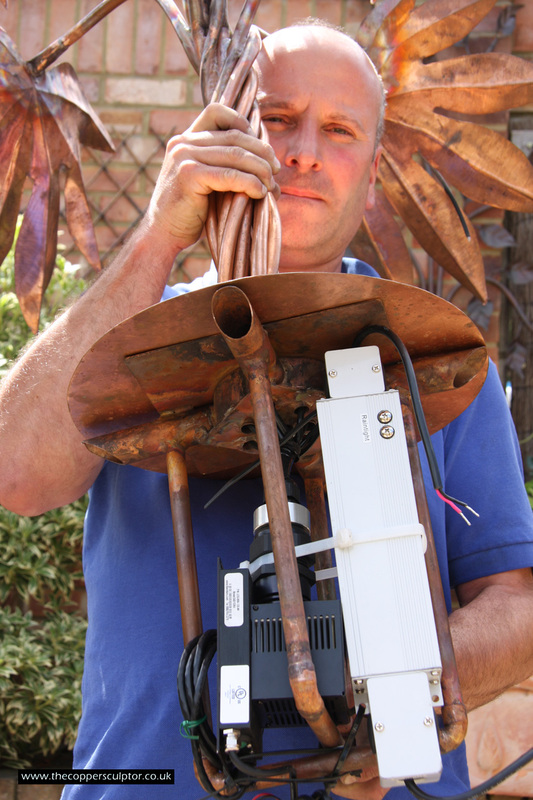 There is a lot of unseen work inside the pot to accommodate the projector and power unit. 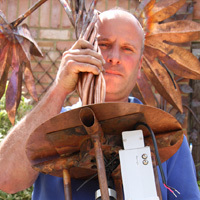 I must make it clear that I do not supply pots or fibre optics but I do need the client to source and supply them to me so that I can work around them. 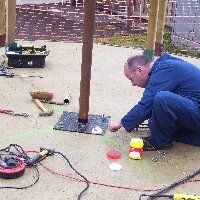 Also they need to be outdoor fibre optics which require installation by an electrician and seem to be very expensive so clients need to explore this avenue first. 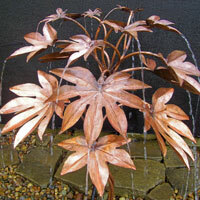 Item no 26/8.5AR This Fatsia was originally built as a stock item as I was very low on sculptures that people could view and the fatsias are one of my favourites. 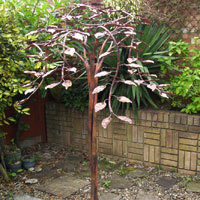 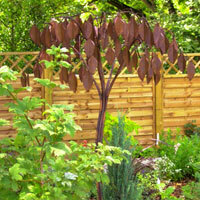 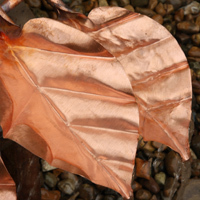 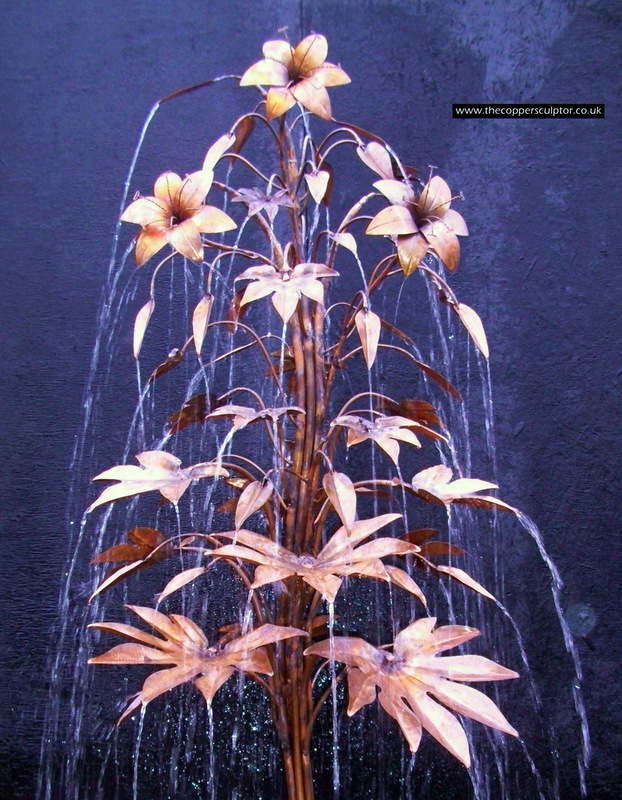 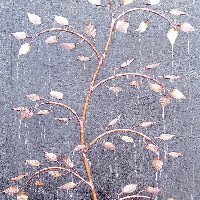 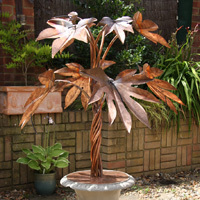 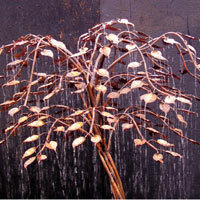 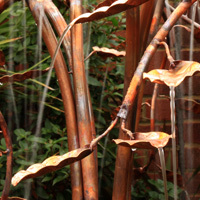 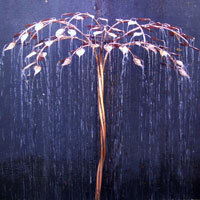 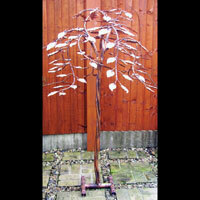 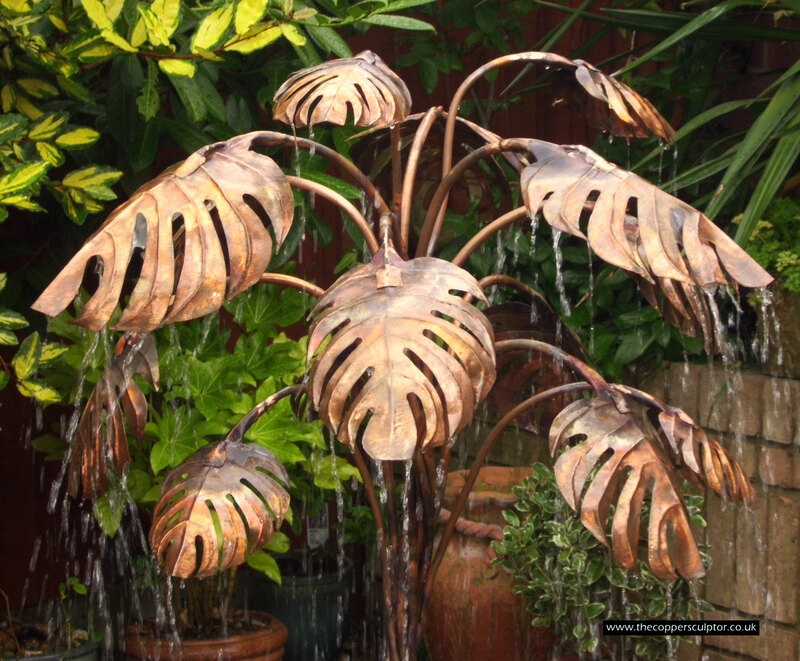 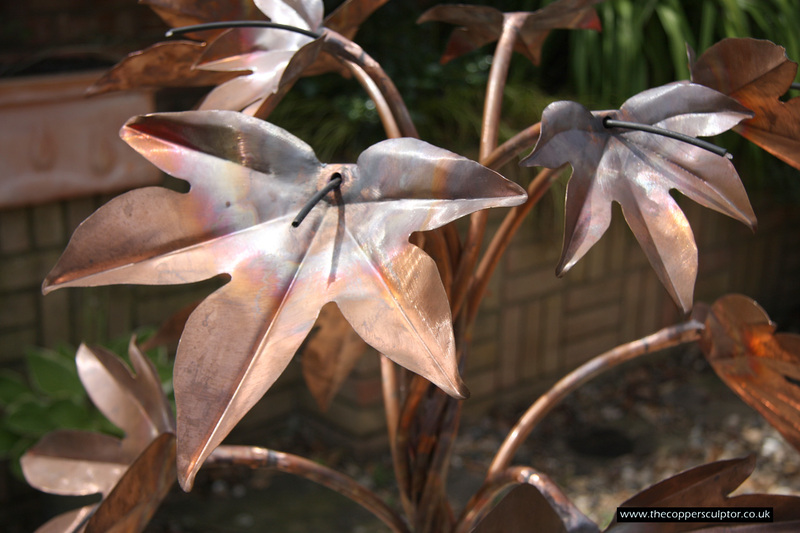 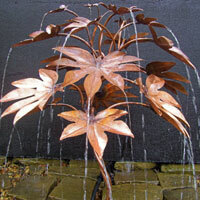 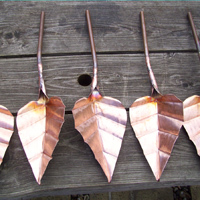 It is on the garden art gallery page, item no 15050914 with 9 water fed leaves priced at £975.00. 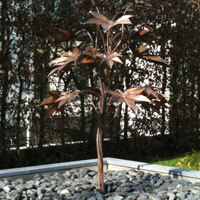 The client liked the Fatsia but said they would like more leaves on it for them. 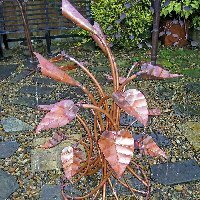 I explained that it was originally specified for a modest price and adding 11 more leaves would enhance the feature to its full potential. 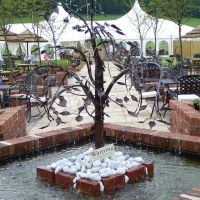 This is the beauty of creating bespoke work. 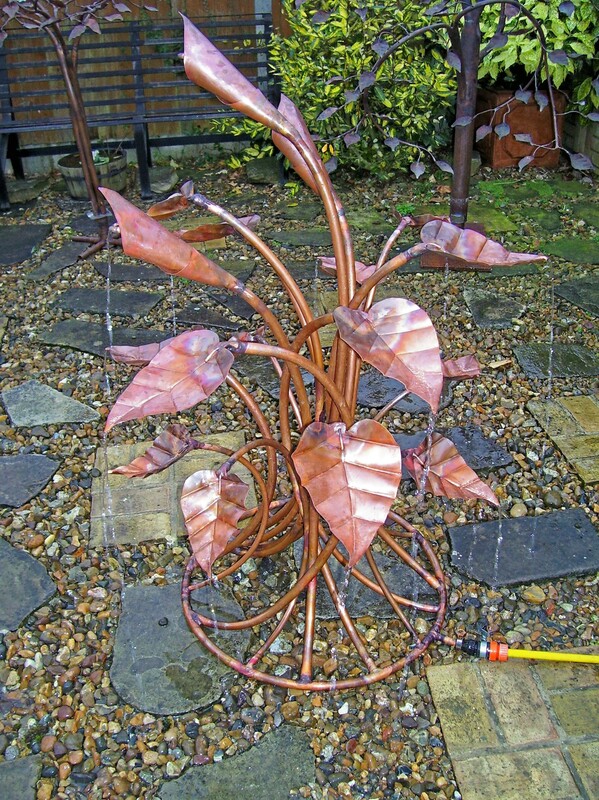 Height 3'11" Width 3'3" 20 Water fed leaves. 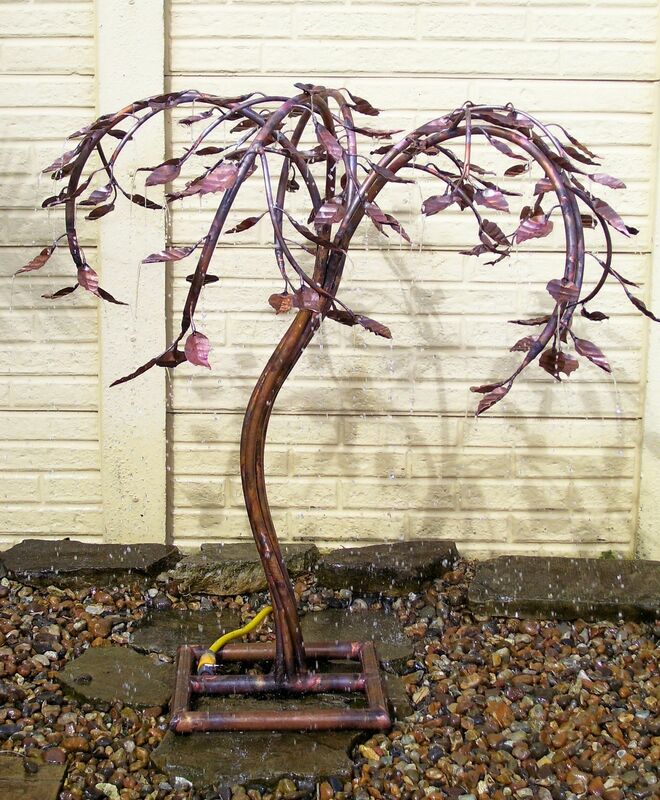 Item no 55/18.5AR The trunk on this sculpture is a favourite of mine because it looks quite twisted from two sides and less twisted from the other two sides, almost like two trees in one. 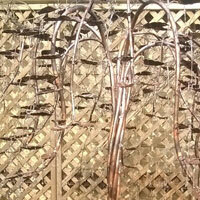 No two trees come out the same but I could make a handed pair that complemented one another if requested. 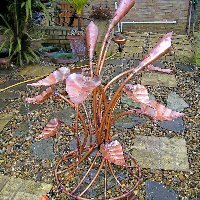 This is as big as they come as the height is governed by the height of my workshop and it is always a bonus if it fits in the van! 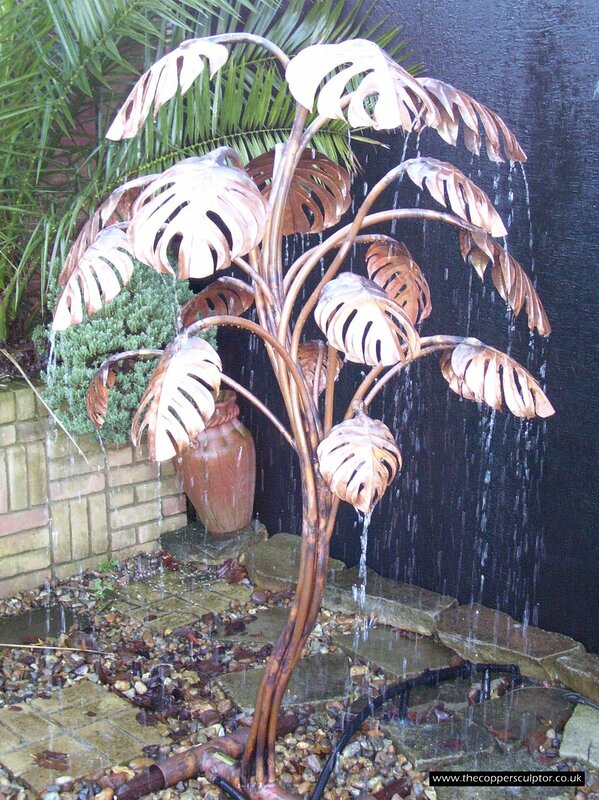 Height 6'7"" Width 4'3" 240 Water fed leaves. 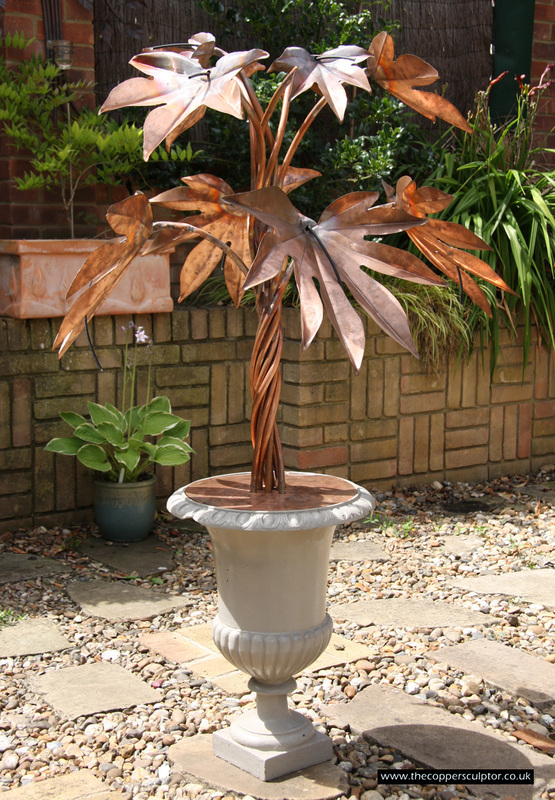 Item no P3000/14 Mixed Feature. 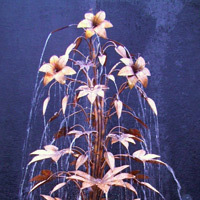 Consisting of 3 stargazer lily flowers and water fed leaves. 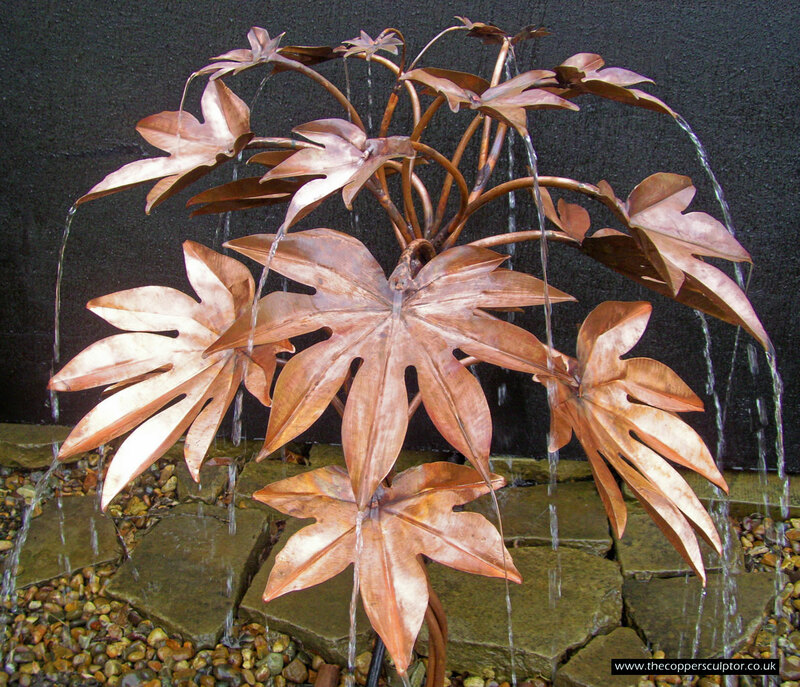 The other type of plant mixed in with it is fatsia which is also water fed, the small fatsia leaves are at the top and they get larger as they reach the bottom. 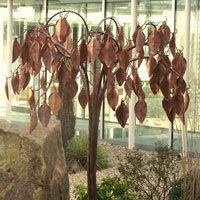 Height 6' Width 3' Depth 3' Approximately 50 water fed leaves. 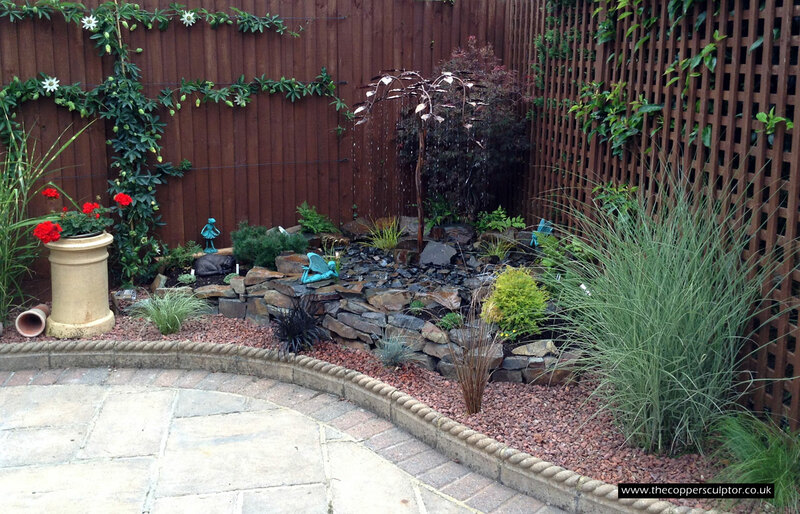 This is an all round feature that can also be made front facing. 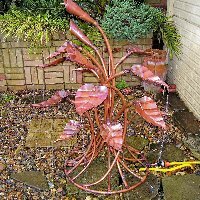 All the images on my website are of my past work, most of which I will try to recreate but not all, as some of the early features do need to move on. 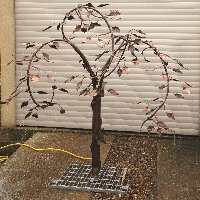 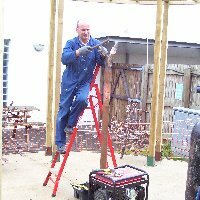 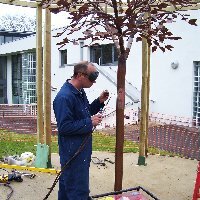 Item no 310106 was the first tree I ever built, almost 11 years ago and is a front facing feature, not appropriate for the client wants to place it somewhere it can be viewed from behind. 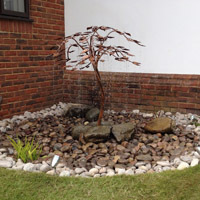 Item no 280206 was the second feature I built and this was also front facing. 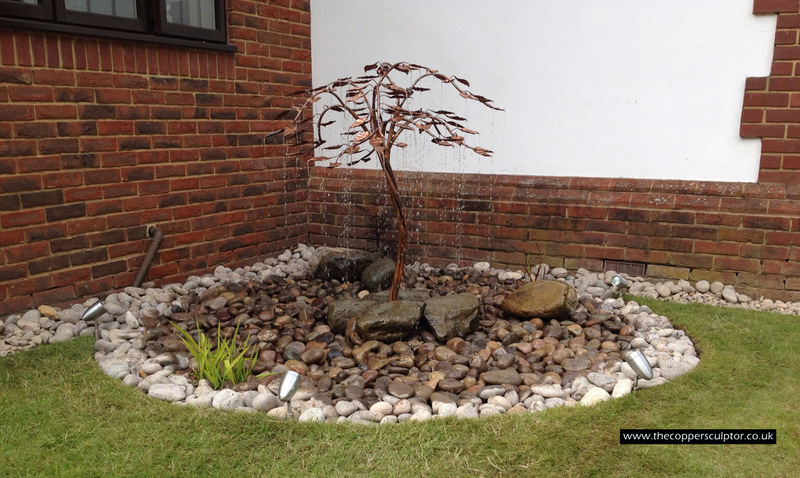 This feature is a likeness of the two and is an all round feature (360°) as this was what my client liked and obviously things have moved on and improved.